This was my first experience with a tour, and I loved it. Great guide, wonderful itinerary and impressive customer service before and throughout the trip. Our group of four friends did the self-guided tour. For busy people, this is really the way to do El Camino. Fresco Tours really takes care of details. We had a wonderful experience. Everything was as described. Every question answered. Dinner suggestions were great! Second tour with Fresco. Their group leaders are the best of the best. The accommodations are top notch. The walk, challenging at times but it is so worth it. Sign me up again! 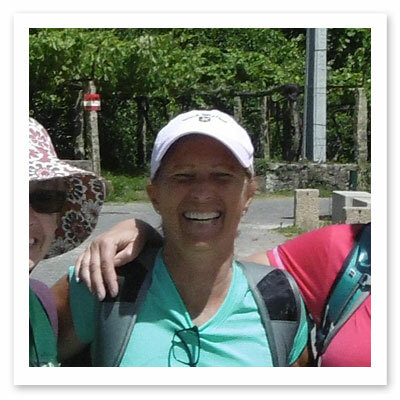 My personal experience walking the Camino exceeded my expectations. I enjoyed every step, every little farming village, every beautiful vista, every stone monument and makeshift cross, every stone bridge and stream, the churches, the shrines, the moss covered stone walls, the flora, the birds and livestock, and the friendly cafés and fabulous coffee, and most importantly, the many pilgrims I met along The Way. All of this enriched a very personal religious and spiritual experience. I cannot thank Fresco enough. I was reminded by very nice waiter at the hotel in Santiago de Compostela, as he over-heard a conversation between two British pilgrims and me, that the pilgrimage to St. James begins as you leave your doorstep. I concur - it was quite an adventure from beginning to end, and one I will not forget. But in my case, it really began with the first e-mail to Fresco, as you guided me from that moment to the very end of The Way. All the information provided and services rendered were outstanding. 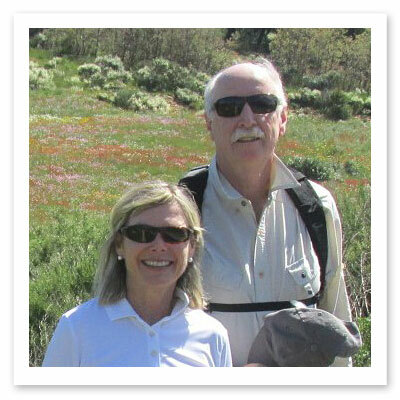 It was an outstanding care and concern given by our Tour Leaders (Jeff and Dolores). 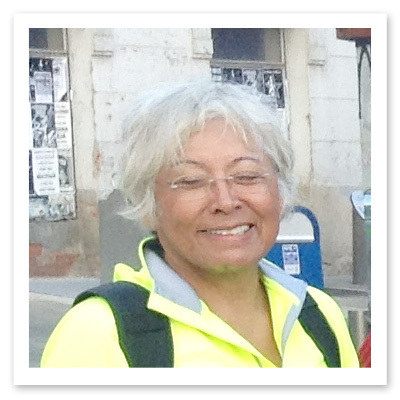 I felt always in very good and capable hands all along the Camino. 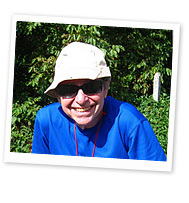 This experience allowed me to appreciate the spirit of the Camino even more fully. I pray to be able to do more Caminos with Fresco Tours. We were so delighted with our experience with Fresco Tours. The lodging facilities were fabulous. Our guides Jason and Margarina were fun, knowledgeable and helpful. We had a fantastic time and I highly recommend using Fresco Tours. 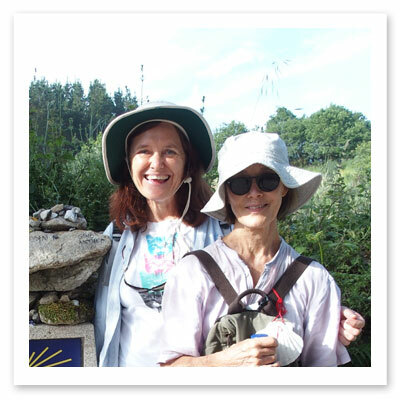 This is our third Camino with Fresco, each of which were incredible journeys. 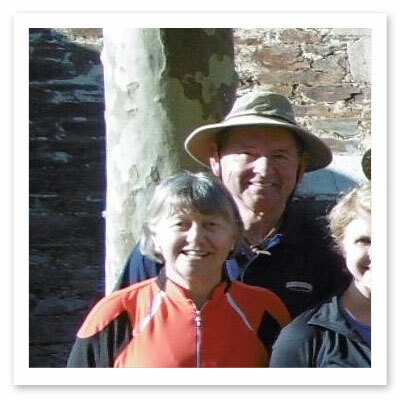 Our guides on this Camino were Jeffery and Alis. They made sure our experience was excellent. The accommodations always the very best. All of the meals delicious! Pedro our driver was great. He always had a smile for us. 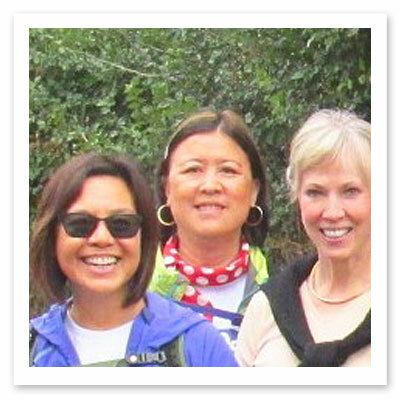 All we can say is that we will do another Camino with the Fresco team again! 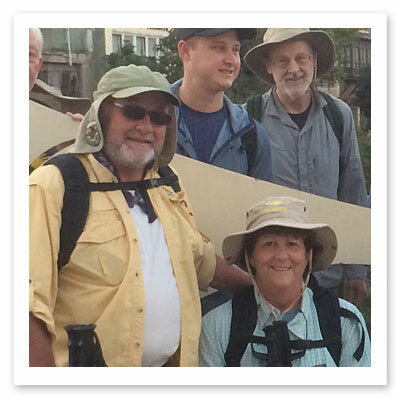 Thank you for Camino memories that will last a lifetime! This was my second Fresco Tour. I returned because I was impressed by the attention to detail. I was not disappointed the second time around. Thank you! 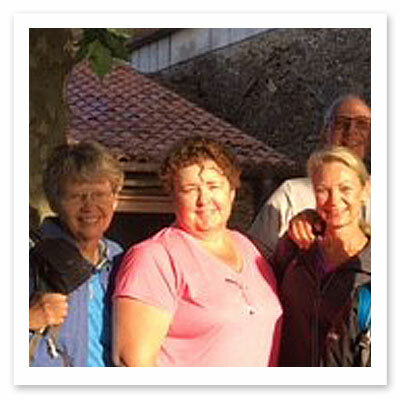 Fresco's guided Camino tour is an adventure made easier by the professionalism and knowledge of the staff. 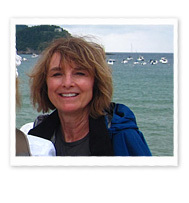 From the moment I signed up for my trip, I felt completely taken care of and assured that every detail was addressed. Fresco's staff was always helpful and responsive to questions. The tour itself went off without a hitch. 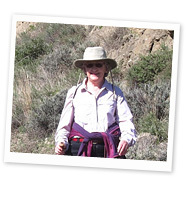 Our guides were patient, flexible, and knowledgeable, and always put our comfort as their top priority. The devil is in the details, and Fresco has this down. I highly recommend Fresco Tours without reservation. Fresco tours did an outstanding job organizing our tour. They exceeded my expectations and I would highly recommend them! A great Comino experience with Fresco Tours. These folks know what they are doing and they do it well! 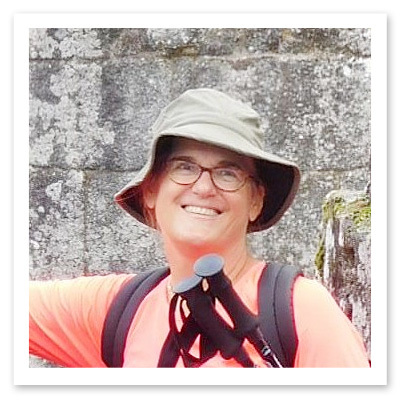 Fresco Tours, the Kinder Camino, was the most thoughtfully perfect tour in every way. 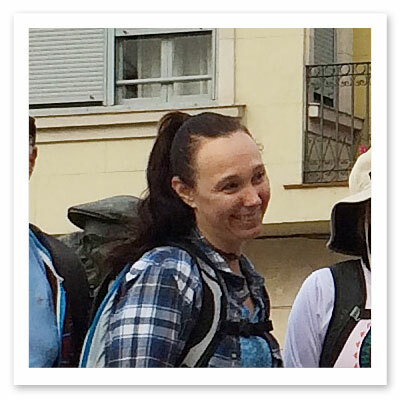 Alissa paved the way with the arrangements, information sharing, and other train/bus travel post-Camino. Jason and Hector were awesome guides. Dani was our superb driver. The accommodations and meals were excellent. This was the best! 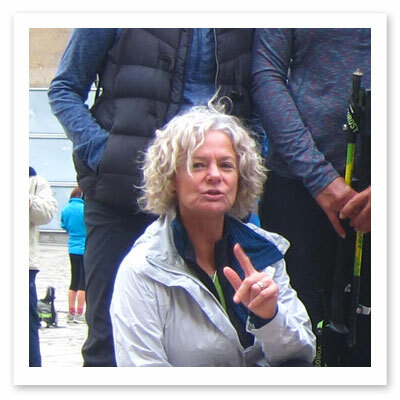 Fresco Tours knows what they are doing when it comes to attention to detail - as evidenced by my experience with them doing the (Kinder) Camino de Santiago in September of 2016. All the questions I could think of were answered before I started to pack. 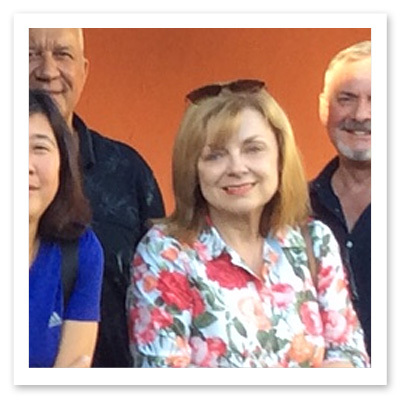 My tour guides were exceptional and mingled with all in my travel group, accommodations exceeded expectations (though I didn't really know what to expect), food was wonderful at every meal, and I always felt safe. If you wish to experience the unrelenting beauty of Spain along the Camino, Fresco should be your choice to guide you through. I'm going back next year with my kids - via FRESCO. 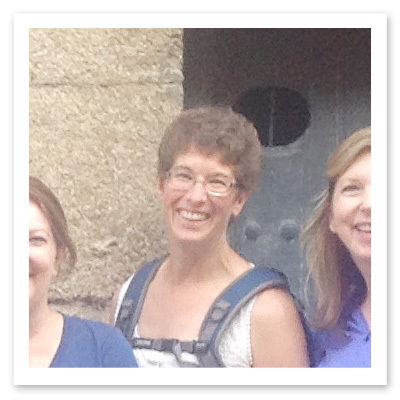 I could not have been more pleased with my Camino experience and Fresco Tours. Our guides, Jason and Hector, were simply the best. Our hotels were to a large extent gorgeous manor homes of the 17th century or older and were simply exquisite. I tried to go without expectations but this trip exceeded any and all expectations. I highly recommend using Fresco Tours. 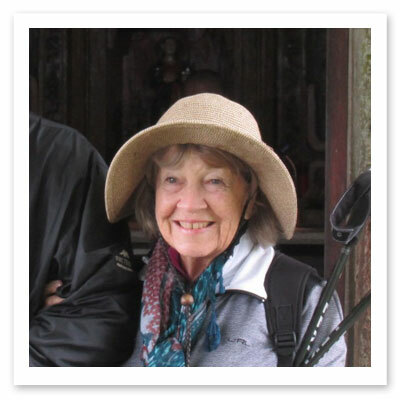 I had a most memorable pilgrimage with our informative guides, our fun group and all the attention to detail we were given in the places we stayed and have wonderful meals. LOVED every minute of our times together!! 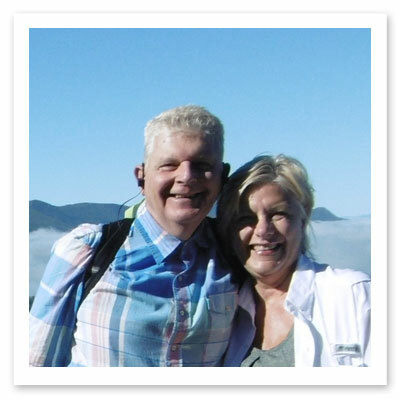 Fresco Tours made accessible an adventure that would not have been possible in another way for me. They arranged memorable accommodations, transferred our luggage, and even met us on the trail with lavish picnics every day. Still, we had to do our own walking! The Camino was our own. This was easily one of the best vacations of my life! Fresco made it manageable and fun. 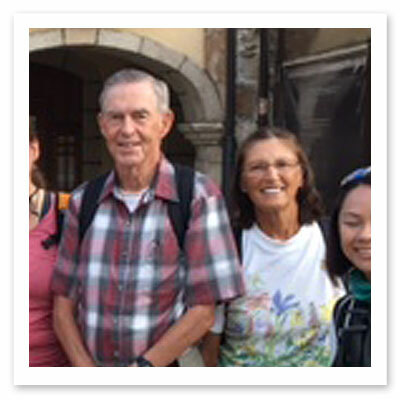 They helped with every step of the way, from booking hotels at the beginning and end of the trip, to making tour suggestions, not to mention the whole self-guided tour. Loved every minute! I would highly recommend this company for an unguided tour. All arrangements worked exactly as they were supposed to. Website information is thorough and helpful in preparing for the trip. The staff were easy to communicate with prior to the tour and very helpful answering questions about the tour as well helping with additional arrangements. The staff at Fresco Tours is amazing. They provide a quick response to all questions and offer a tremendous amount of support in planning your tour to meet your needs. The Camino Tour surpassed all of our expectations. 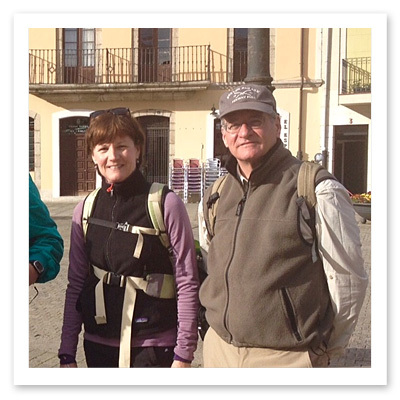 Fresco made the Camino come alive with their knowledgeable guides, special places to stay and incredible meals. 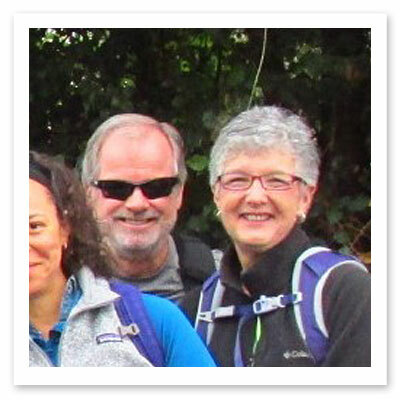 They allowed each of us to experience our own Camino. It was truly a magical and spiritual journey with new friends and new experiences around every corner! 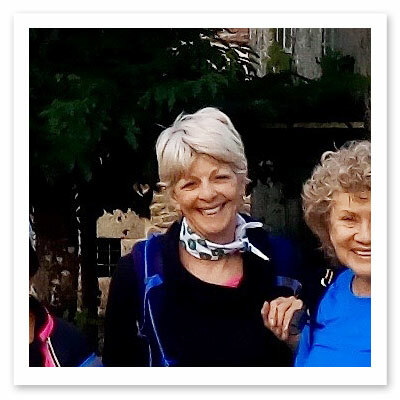 As a Fresco client, you only need to concentrate on walking your Camino, making new and wonderful friends, enjoy the food and drink, share in the laughter and words of encouragement and learn about a wonderful culture. Fresco Tours does the rest. With Fresco Tours; You are family! I was very satisfied with Fresco Tour. Our guides, David and Ana, were excellent in their job. The picnic lunches were such a good sight to see after walking in the morning. We were a group of 15 and it felt like we were all friends before the walk. I'm sure we will remain friends after the walk too. 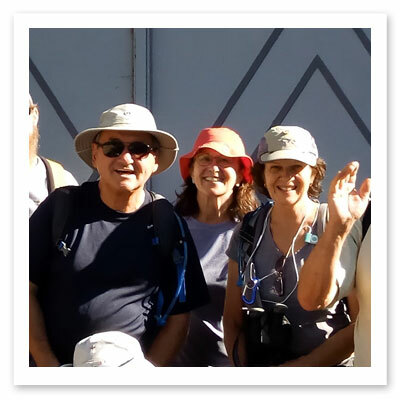 Overall, the walk was an experience in itself and Fresco Tour did a great job overall in our guides, our drivers, lodging and food. I would recommend this company to people. Our fresco tour was extremely well organized. Every email regarding questions was answered promptly. The hotels and meals were excellent. I would highly recommend this tour to anyone. We are happy customers of Fresco tours. Throughout the process communication was excellent. The pick up and delivery of luggage made our Camino pilgrimage less burdensome than having to carry a lot of things with us. With few exceptions, the hotel choices were very good. We enjoyed some excellent accommodations that we will never forget! Everyone in our group became friends and really watched out for each other. When we had meals together the comradery was evident. These were days that we will never forget. It is wonderful to relive our memories through photographs and the friends we met along the way. 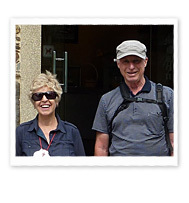 Fresco Tours provides a fantastic alternative for those that want a guided tour in style along the Camino. Every aspect and detail of our trip was looked after professionally and the guides were first class. 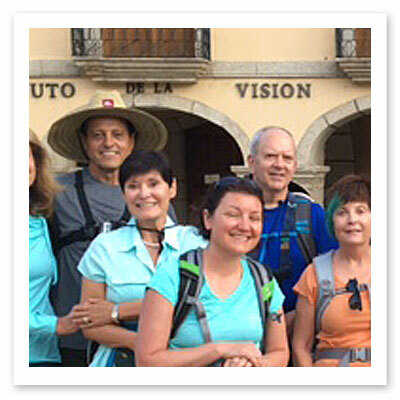 Being able to experience the Camino in a small group at our own pace was fantastic. I would recommend Fresco to anyone considering a first class tour of the Camino. 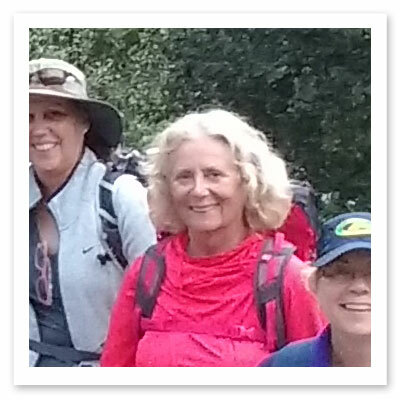 To walk the Camino was high on my bucket-list. I really think going with Fresco helped make it worry-free and achievable ... I enjoyed my walk thoroughly. We had an awesome group and Ana and David were wonderful guides. Mucho gracias. Buen Camino!! We found the whole experience, from first contact to completion of the tour, to be very positive. Fresco makes its customers feel valued and cared for. We would recommend it highly. 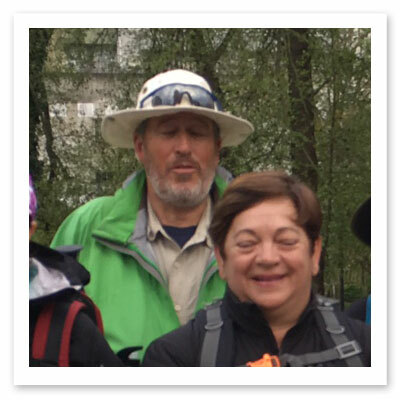 I thought Fresco Tours did an outstanding job at making our Camino successful. They are just enough hands-on to eliminate fears of the unknown (Where to go, how to get there, where to stay, etc. ), but hands-off enough that you feel the excitement of adventure and accomplishment. 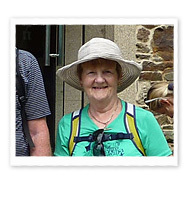 I would recommend Fresco Tours to anyone that wants to walk the Camino, but doesn't want to carry everything and doesn't want to stay in Albergues (Pilgrim Inns). We have taken several tours in many countries, and this was by far and away the most enjoyable we have taken. Guides were more like friends after the journey was complete. They MADE the tour. They were able to coordinate the varied paces of all our participants. Muchas gracias and Buen Camino. We thoroughly enjoyed the trip. The countryside in northwest Spain is very beautiful, and the villages and towns are interesting combinations of old and new. The accommodations were all comfortable and unique -- we liked every one of them. Our hosts were all charming. The food was really good and very tasty. 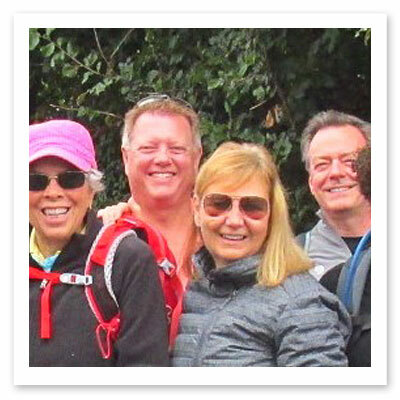 We knew many of our fellow travelers and those we did not know before became friends during the Camino. Roberto and Irene were wonderful guides. They were very knowledgeable, enthusiastic, patient and kind. Both of them made real efforts to make each of our days a pleasure with much laughter. They are also very good at preparing delightful picnics. And, don't forget the drivers, Pepe, Carlos and Enrique were all good. Muchas gracias por todo. This was easily one of the best vacations of my life! Fresco made it manageable and fun. 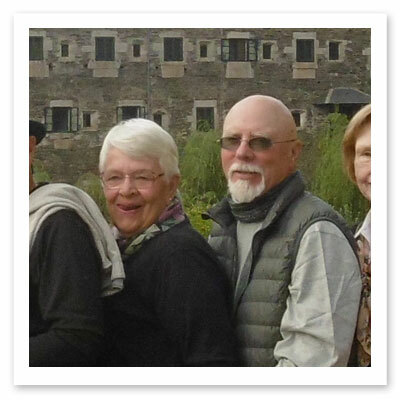 They helped with every step of the way, from booking hotels at the beginning and end of the trip, to making tour suggestions, not to mention the whole self-guided tour. Loved every minute!! 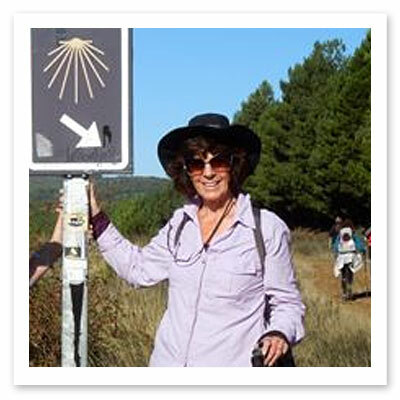 Whether the Camino is religious, spiritual or cultural I found it to be profoundly personal. It tested me, pushed me and helped me to get in touch with what is inside me. 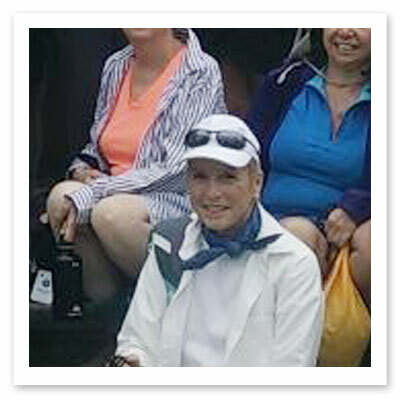 It was not so much crossing the finish line as reflecting on the process of my journey in getting there. What an adventure! Arrangements Worked Exactly As They Were Supposed To. Belle from California, USA. Wonderful experience traveling with Fresco Tours! I've been with them 3 times and will return again in the near future. 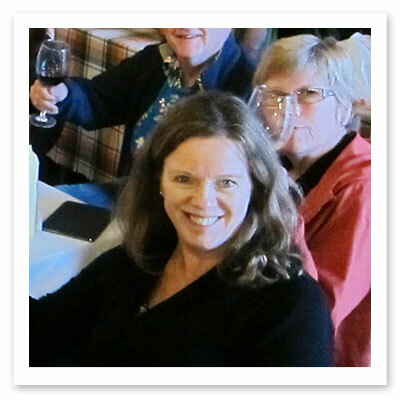 I highly recommend Fresco Tours--very professional and caring staff and well organized tour as well as fabulous meals and great accommodations. 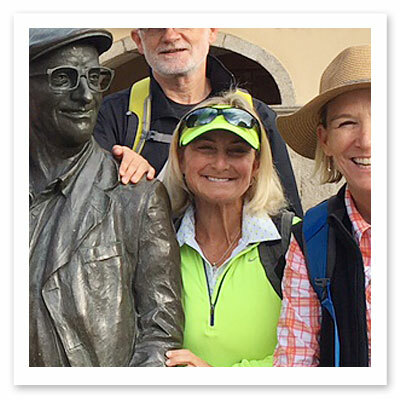 It was the tour of a lifetime-a kinder, gentler Camino which I will never forget! 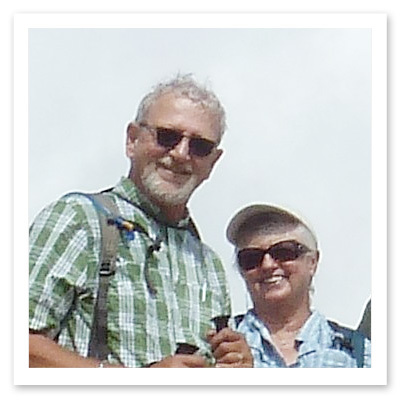 The Kinder Camino proved to be one of the best vacations we have ever experienced in our lives. Our leaders, Raul and Alis, were of the highest standard in all regards. 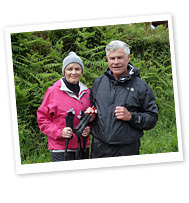 The lush countryside, accommodations, food and the joy of walking every day brought daily delights. Thank you, Fresco Tours! 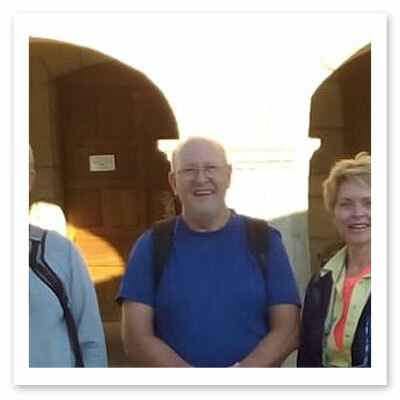 I would highly recommend Fresco Tours to anyone who wants to do live the Camino Experience while enjoying excellent company, comfortable accommodations, caring and knowledgeable guides and superb organization. This was one of my best vacations. Wonderful tour guides Ana and Jason very professional, very informative re our walk. They gave us a very good understanding of what we faced every day. 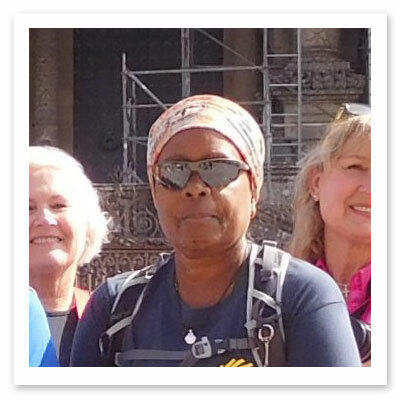 My experience of walking the Camino to Santiago de Compostela with Fresco Tours was a meaningful, wonderful and even emotional experience. 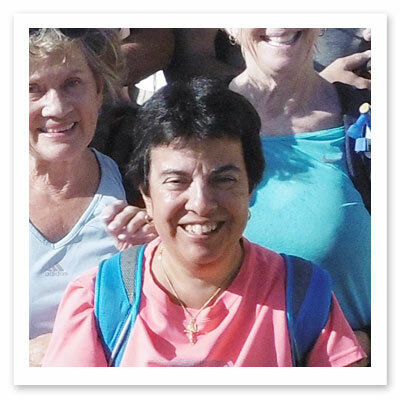 Much more than a walk with friends in the beautiful countryside of Spain. I highly recommend it! Fresco Tours were sensitive to the needs of all the pilgrims in our group. We had fast walkers and crawlers but the staff accommodated us all. I always felt safe and that staff cared. 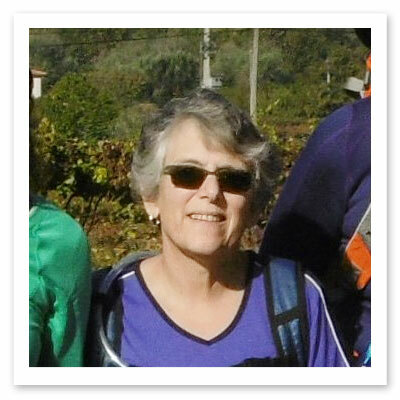 The staff continually stressed that the Camino de Santiago was an individual journey and not a competitive walk. Buen Camino!! A "once in a lifetime" experience for me & 3 other friends. 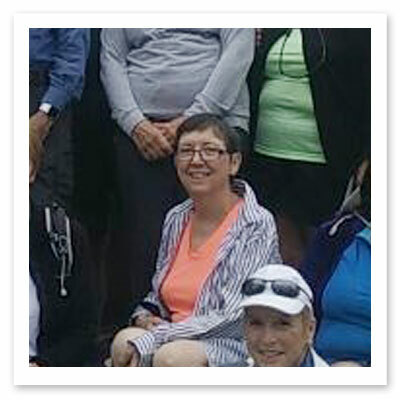 Tour very well organized - superb meals, guides, accommodations - able assistance along the way if we encountered difficulties - I give the trip a 10+ rating! Go for it - you won't regret it! Tour guides incredibly helpful, friendly and fun. Pacing was great. From planning to completion everyone was so helpful. 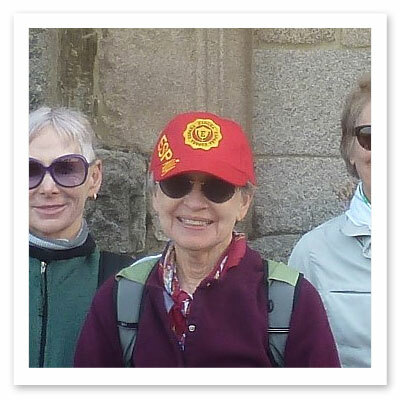 Thank you all for a wonderful Camino experience! We could not be happier with the accommodations and meals but most especially our guides Alis and Raul. They are amazing people and took very good care of us. Their endless patience with us in answering all our questions about the language and the culture of Galicia and their good humour and intelligence made the trip a great pleasure. It was also a pleasure to meet Alex and get a better understanding of why Fresco is such a well-run company. All the best. I enjoyed the tour immensely. I felt it was very well organized and all needs were taken care of. Both Ana and Jason were wonderful guides, so full of history and information of every type. Also, the picnic salads were delicious. It was great to meet Alex. 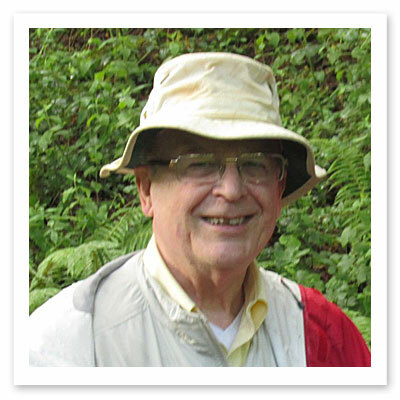 He said he does not get out on the trail enough so it was especially good to have him with us for a couple of days. I would have no hesitation to recommend Fresco Tours to anyone. Our trip with this particular group along the Camino was a treasure of memories, fun, fantastic views and food as well the joy of making new friends. Blake and I cannot give enough praise to our exceptional leaders, Raul and Alis, and our bus driver Daniel. Fresco Tours is blessed to have them as staff. Wonderful to meet you all! Be blessed and Buen Camino! If you want the experience of a lifetime with the best tour guides available, then this is the trip for you. My husband and I enjoyed each and every minute of this trip and I highly recommend it. Fresco Tours did all the work and we had all the fun. Great company to deal with and great people to get to know. We definitely look forward to doing another tour with them. 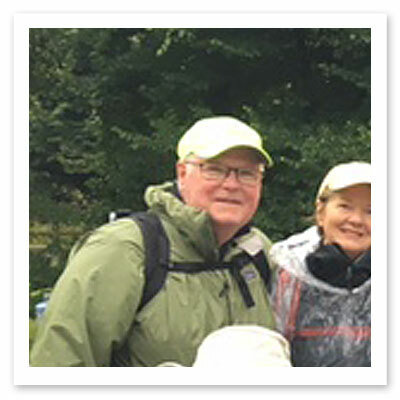 The experience of the pilgrimage to Santiago de Compostela was made even more significant and enjoyable by the professionalism, enthusiasm, and kindness of all the people at Fresco Tours. Thanks to David, Raul, Luis, Alissa, and Alex for all your help and for making this journey one that I will never forget! I have traveled a lot to many places this was the best. 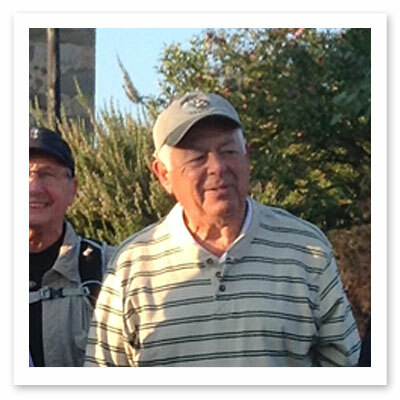 I am 81 years young and David and Raul made me feel young and that I could do the Camino. Thank you, they are very special men. I can't say enough about the outstanding experience we had walking the Camino de Santiago with Fresco Tours. They exceeded our expectations in every way. The guides were outstanding; hotels were lovely pleasant places to stay. The walk was truly a meaningful and prayerful experience. 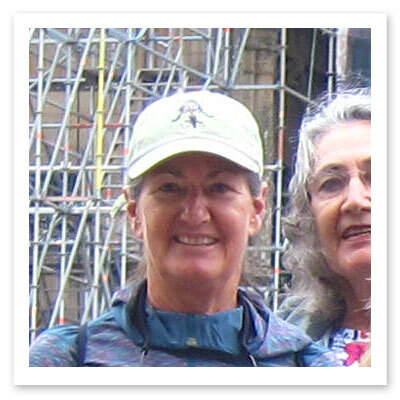 I hope to go again with Fresco on another Camino. 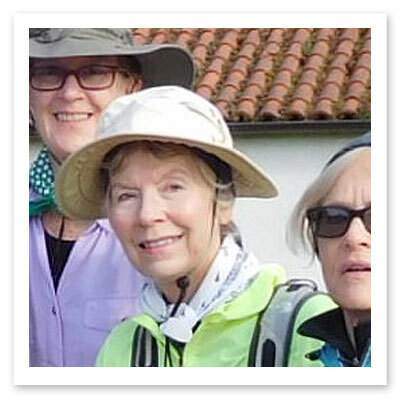 The Kinder Camino was a wonderful way for a group of people with diverse challenges to complete the pilgrim's walk. David and Raul were outstanding guides who made it possible for each of us to complete the walk in his/her own way. We spent 10 days with a lovely group of people who made the journey more meaningful. I miss you all!! Fresco Tours prepared us very thoroughly for this trip. Their choice of accommodation and attention to detail added to our enjoyment. We will be traveling with Fresco Tours again and will recommend them to our friends and families. This was truly the best vacation I've ever had. I got to do something that was nourishing for my body and mind in a wonderful setting while meeting lovely people; both locals and group mates. 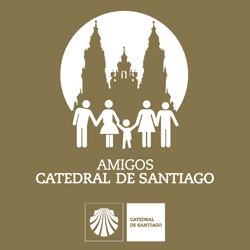 The entire time, I felt cared for and not like I was just a number; it started with Elba and Alex's correspondence, and ended with the Cathedral of Santiago as the destination. I highly recommend Fresco Tours. Good to Know that We were in Good Hands! What a great time I had on the trip, it was an incredible experience. I can't say enough good things about both Alis and Carol (and Pepe)! 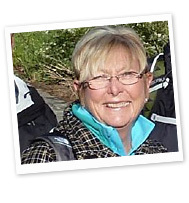 Friendly, professional, knowledgeable and ever helpful. I know that everyone in the group felt the same about them. It felt good to know that we were in good hands! Thanks for everything. Our trip on Fresco Tours far exceeded all of our expectations! 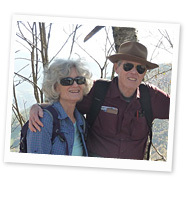 Our guides and driver were knowledgeable, friendly, solicitous and caring. Every need was anticipated, our routes were well-planned and every day was a delight. Meals were delicious, and accommodations were comfortable. Can't recommend this enough! We are very glad that we did this tour. It was our intention to do it after my 60th birthday; however, it did not work, and I kept postponed it. This year we decided to do it. 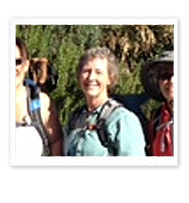 After looking for the Camino in the internet, I found the Fresco Tours website. I visited it and read the testimonial from other pilgrims. I contacted Alissa regarding it and everything was settled. We are very pleased that we did it. We had a great experience and met new peoples. Our guides, Carol and Alis, were amazing. Pepe, the bus driver, was very friendly. When we did our checking, we always told him, (los dos últimos) i.e. our names were the last two in the list. We highly recommend the tour. We felt spoiled from start to finish. Very professional staff at the office and on the Camino met our every need. Well done! Fresco Tours leaves NOTHING to chance. They have thought of everything and are prepared for everything. 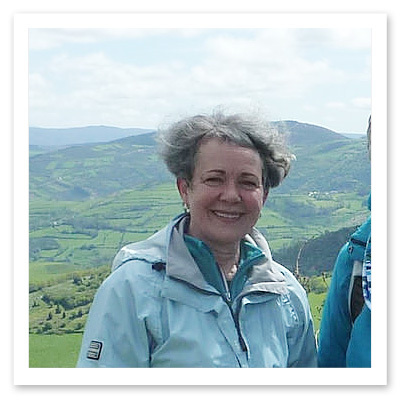 I recommend Fresco Tours for anyone interested in the Camino. 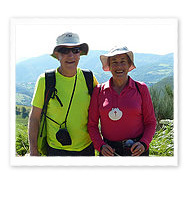 Fresco Tours provided an option for experiencing the Camino in a way that met my needs. I appreciated knowing that I could have this adventure and not have to worry about where I would be sleeping at night! Everyone should experience the Camino with Fresco Tours. Fresco Tours Have Taken Care of the Details! 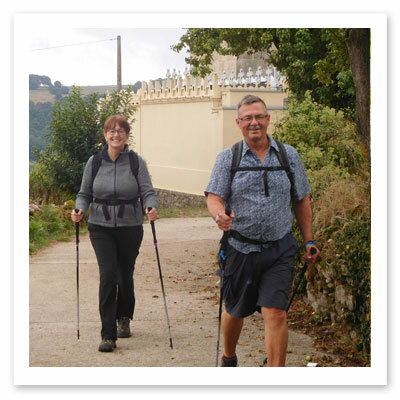 A great way to discover the Camino & at your own pace. 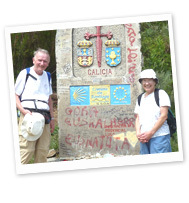 You can fall completely into the experience that is the Camino - knowing that from start to finish, the professionals at Fresco Tours have taken care of the details! 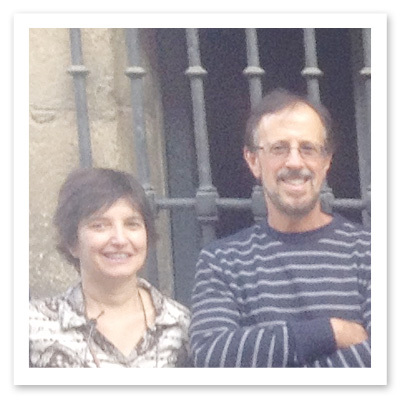 Our Fresco guides David and Montse were absolutely the best guides.! The quality of the information and support provided far exceeded my expectations. The accommodations were charming and comfortable. The food, especially the picnics, far exceeded my expectations! 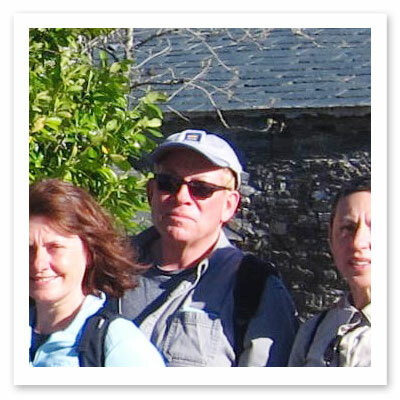 This is an excellent company for touring the Camino de Santiago. They provided all meals, sleeping arrangements, tour guides and a van and did it in a caring manner. My wife and I rate this Company a 10 out of 10. I have been traveling for many years, and from personal experience can say that without a doubt this is the most professionally run, efficient and detail-oriented tour company I have ever dealt with. 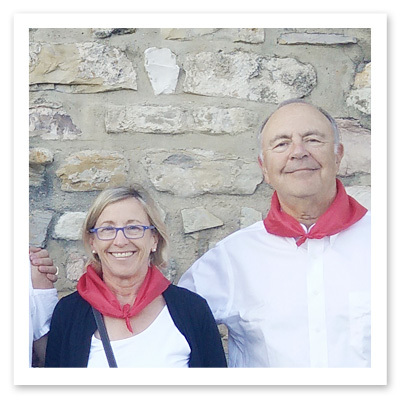 The icing on the cake was that our two guides, David and Montse, were outstanding individuals, not only in the knowledge of the history of the area, but due to their innate and genuine qualities of kindness, compassion, and their professionalism. 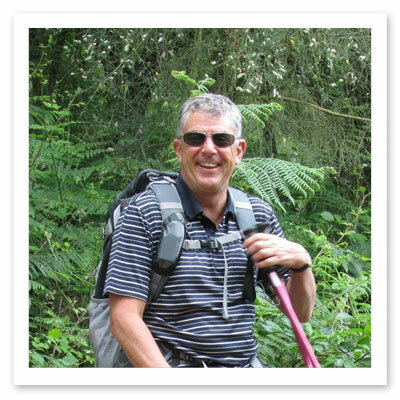 Best Camino Tour operator! There is no close second in terms of itineraries, logistics, guides, experiences and pricing.... Always thinking outside the box in providing a better adventure from year to year. It was the trip of a lifetime. But, just the first. There are more Fresco Tours to take. 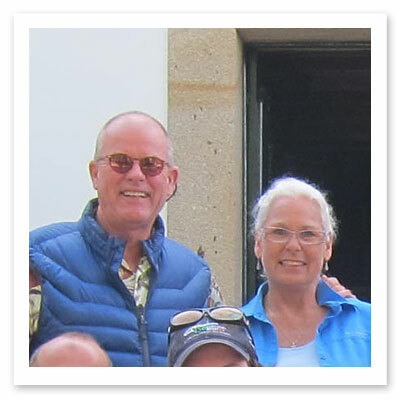 David and Montse are the most kind hearted, giving, loving, gracious guides I have ever had and I am a veteran of a dozen long term River Rafting tours in the western U.S. I am used to prideful and somewhat surly guides who act like they are Superman or Superwoman because of their physical skills.... How refreshing it was to have two guides that obviously are physically more than accomplished at all tasks and are able to rise to all occasions with kindness, good judgement, tact and a smile. What a wonderful, memorable time I had on the Fresco Tour! Our tour guide says it is the Magic of the Camino. I think it is the amazingly dedicated staff...you, David, Montse, Bruno, and all the people behind the scenes that create the magic! People say that we do not choose when to walk the El Camino, rather the road chooses for us. I believe this held true for me. With that said, I believe in some way that Fresco Tours beckoned and assured me that my journey would be safe and comforting if I let them be my guide and gently show me direction. It was an honor to meet all the knowledgeable and professional pilgrims from the Fresco family who truly showed me the way with incredible wine, food, history, friendship and accommodations. 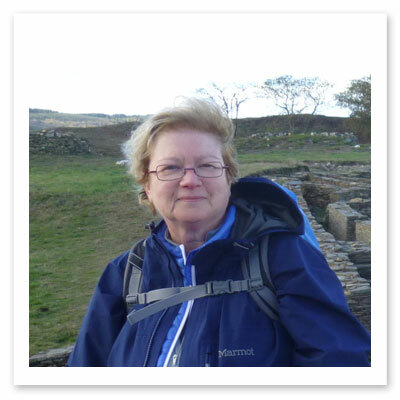 I am a peaceful pilgrim who extends much gratitude to all at Fresco Tours. Fresco Tours did a terrific job of taking care of every guest need, while leaving us to enjoy ourselves and the group on our own. The accommodations were universally outstanding and the picnic lunches worth writing home about. We do lots of tours; these guides were among the best. All in all, it was a perfect balance of everything and could not have been better! Fresco Tours made my trip memorable more than words can ever describe. 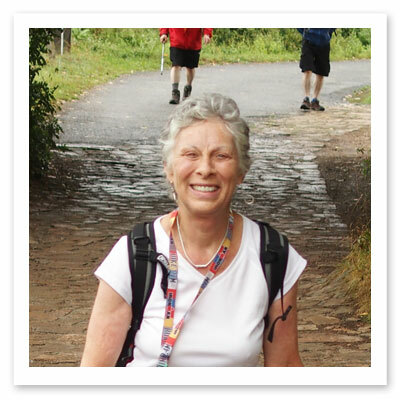 From the ease of navigating on the website, to working with Alissa, to the actual walk itself. The accommodations were first class, the food was great (and I admit I am a food snob) and the guides were knowledgeable and personable. I would highly recommend this experience for the cultural and spiritual reasons. Even if you just want to walk it is a great way to see the countryside. 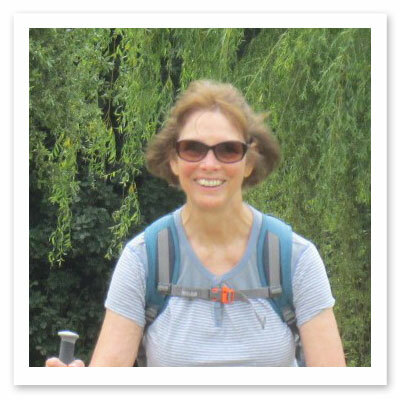 I can't wait to walk the French Camino next year! Fresco Tours provided the VERY best of accommodations, food and the VERY BEST of tour leaders that made EVERY DAY a HAPPY DAY. Thank you Fresco, Jason, Irene and Pepe. This was the Sixth for Me! Thank you for hosting another wonderful Camino. This was the sixth for me! Although some may wonder how I can take the same tour six times, I can say that for a single traveler who would like the security of group travel along with wonderful food and lodging, it is a "sure thing"! The different groups, Fresco guides, and other pilgrims always add variety to the experience. A Wonderful Memory of a Lifetime! 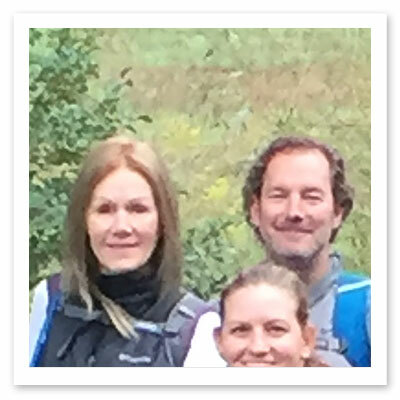 My wife and I just completed the Camino de Santiago with our tour guides Jason and Irene. It was an amazing experience and adventure. Though a challenge at times, it was well worth the effort and Jason and Irene made it extra special. They were awesome! A wonderful memory of a lifetime! As always Fresco Tours delivers. Great food, accommodations and guides. If a problem arises, they always address the situation and help to solve it. I would highly recommend Fresco Tours self-guided tour. It turned out just as I had imagined, it was one of my most memorable trips ever! We thought it was a great experience. We thought the guides were great and had an impressive commitment to excellence. There were challenges along the way and they dealt with them beautifully. We would highly recommend fresco tours. This was an extremely well run tour that was self-guided, but we were given excellent maps and info to guide us on our way. I would recommend this to anyone interested in doing this through this remote, rural part of Spain, which is so very beautiful. It is not difficult terrain and I found it a very spiritual journey. Although we generally feel confined by the strictures of group tours, Fresco Tours gave us a phenomenal overall experience by its attention to detail and the wishes of its clients. Fresco Tours is the best for hikes in Spain. Wouldn't use any other company. Fantastic experience in all categories. We were in good hands and loved our guides. Accommodations and food were first class. No complaints what so ever. Highly recommend this tour. 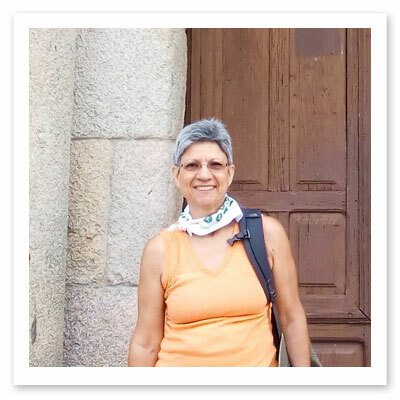 The tour was fantastic in every aspect, our guides Carol and Ana were exceptional in their knowledge of the Camino walk, the history, food, villages we passed through, placed we stayed etc. Really loved their lunches they provided each day, only had to mention that we liked something and wow the next day it was on the menu, no trouble for them to purchase my kiwi fruit which was much appreciate. So all in all I give the tour 11 out of 10. Hope to catch up again in 2018. I really enjoyed the Kinder Portuguese tour. At my age, it was just right! I believe I discovered some of the spiritual gifts of such a treasured pilgrimage. The wonderful friends making the pilgrimage were a big part of the gift. This is my second tour with Fresco and once again Alex and his staff have put together a first class experience. Wonderful people, food, wine, accommodations and of course service. I have bragged about Fresco and once again they out did themselves. Good Job to Alex and his team. This Kinder Camino Tour is one of the best things I have done in my life. The fact that all the details were taken care of, allowed me, firstly, to commit to it, and secondly, to DO the walking. Alex and his team at Fresco is the only tour company I would recommend offering similar tours. From the beginning of the tour to the end, they have thought of everything to make the trip enjoyable and hassle free. 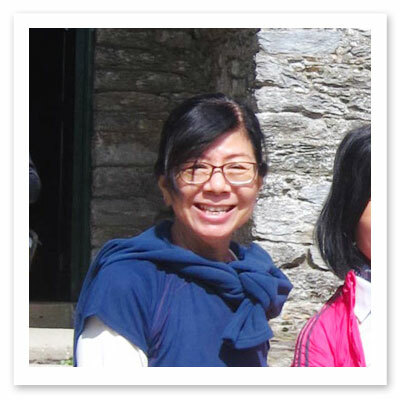 The guides are friendly, speak flawless English and are very personable. We have had 3 different Camino trips with Fresco and it had been a wonderful experience to explore the various cultures, history and geography of Spain. 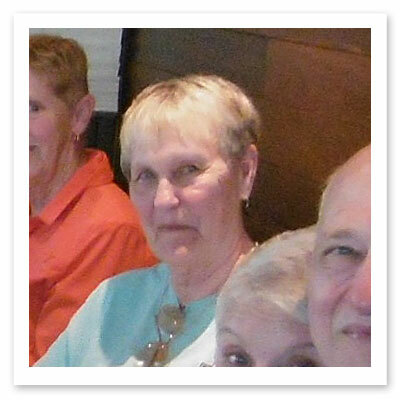 The guides and back office have been extremely helpful and knowledgeable. Highly recommended for your bucket list. We have just completed our 2nd Fresco Tour in Portugal. Different from the French way but really couldn't say one was better than the other, they were both great. Nothing better than a pilgrimage in style. 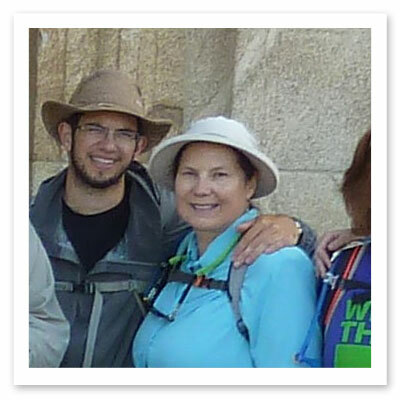 My mother and I walked the Camino de Santiago together. We could not have asked for a better experience with Fresco Tours. It was the perfect balance of freedom and comfort. We hiked each day by ourselves and were responsible for our own meals, yet we had a comfortable place to stay each night and helpful maps and people along the way. 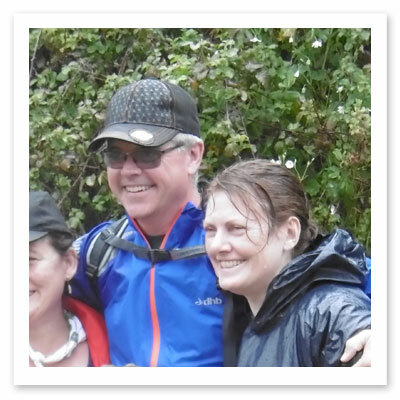 We hope to do another Camino in the future and will definitely be using Fresco again. This was one of the most incredible and inspiring experience I've ever had. 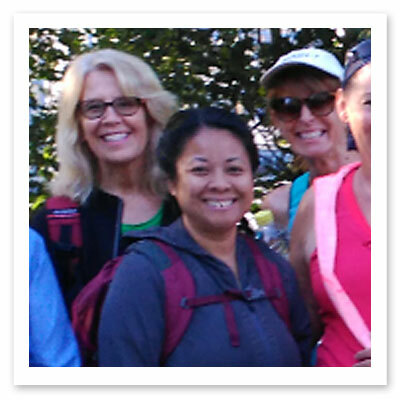 I loved the way my companions in this journey pulled together to support and encourage each other especially on the days that we needed that extra motivation. I felt like I was leaving family when the tour ended and we each went our separate ways. They will all be in my heart forever. My wife and I could not have been happier with our experience with Fresco Tours. Our guides Roberto and Alis are the best. They took care of everything, hotels, meals, telling and giving us our route plans for the next day, wallet recovery for less than careful me, and blister repair. All we had to do was walk. We had great weather which always helps. Having the bus at various checkpoints on the route, allowed us to refill waters, drop off clothes and get on if needed. all the hotels were fine and a couple that were outstanding. 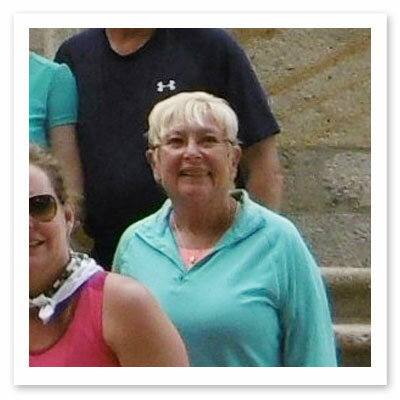 Regarding food and wine, if your objective is to lose weight, this is the wrong tour. 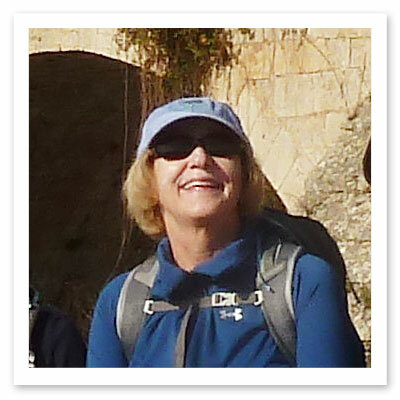 If you are going to walk Spain, Fresco Tours is without a doubt, the best option. Our trip was amazing in how smooth all the details were handled. The 115 km Fresco Start was just the right tour for us. I really liked being able to walk at our own pace, yet knowing there was a good hotel and hot shower at the end of the day to greet us. Well done Fresco! 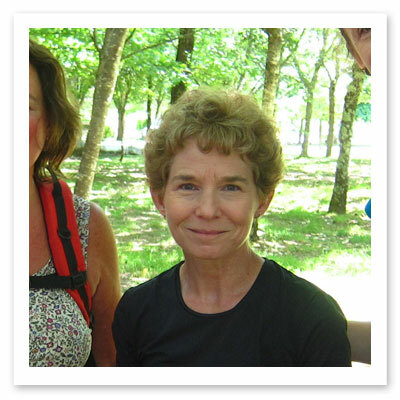 I would highly suggest Fresco Tours for any piece of your Camino Journey. We loved every aspect our trip made so easy by Fresco. The planning was perfectly executed pre - trip and the ease of which we experienced the Camino was made possible by Fresco Tours. Our pilgrim experience with Fresco Tours was amazing! 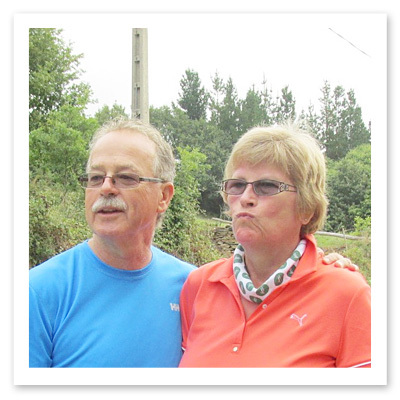 The elation we felt on completing our Camino is impossible to describe. 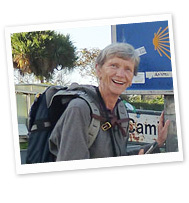 My advice is plan your Camino without delay. The Way is difficult but the reward is worth every step. I highly recommend Fresco Tours. They made the trip very special with no stress. The only thing I needed to do was grab my hydration pack and walk/run each day. 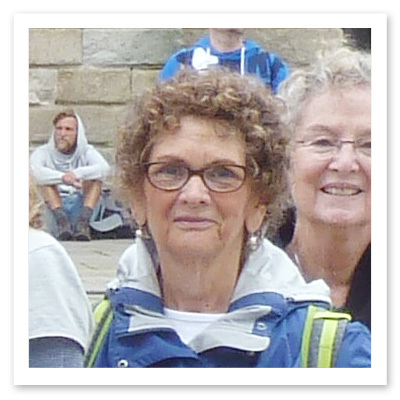 I was able to focus on my intentions for coming on this trip and enjoy the company of my fellow pilgrims. 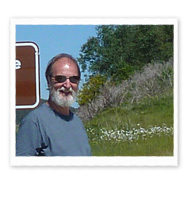 I would highly recommend this tour to anyone who wants a very smooth Camino experience. Fresco takes all the work out of organizing the hike and all you have to do is show up and be ready to walk. Could not be happier with their service! 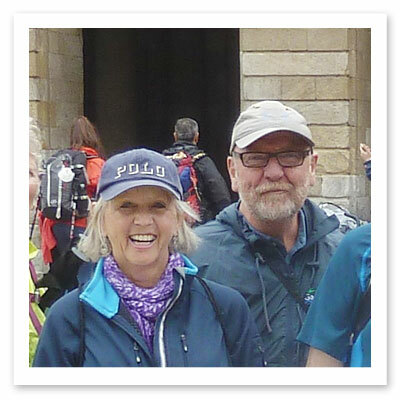 We had three weeks in Spain; too daily luxurious and one on the Camino with Fresco, and the week on the Camino was the highlight of the trip. 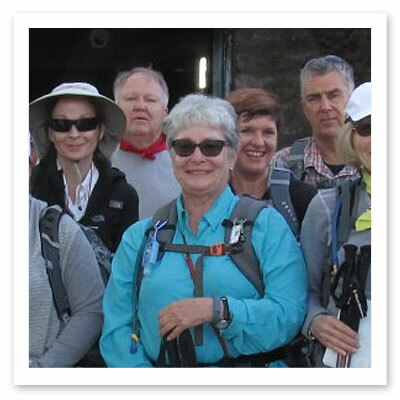 There's a quiet "zen" when you're walking, a camaraderie with both your group and the other pilgrims you meet and re-meet along the way, and a wonderful sense of accomplishment when you finish. Found the 'Kinder Camino' very kind indeed!! Jason and Ana were perfect guides--caring and thoughtful, competent and knowledgeable, well-organized and meticulous and much more. 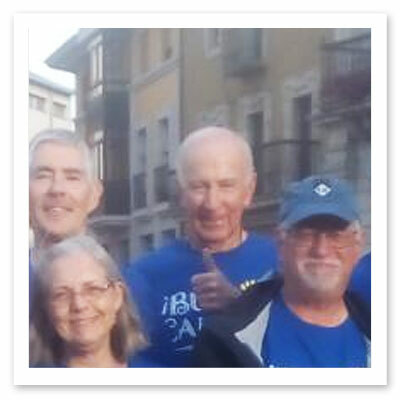 They definitely played a significant part in making the Camino an event in my life that I will remember for a long time. The comfortable accommodation and the good food and wine provided weren't too bad either. 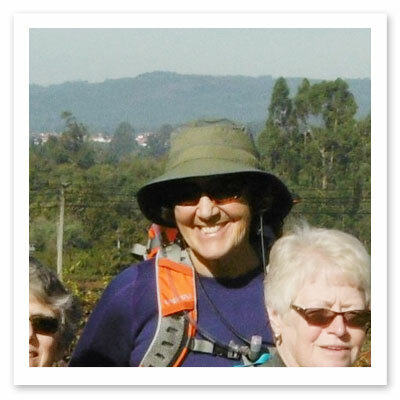 It's a tour that I will certainly recommend to friends who are keen to do the Camino. Neelam and I and our daughter Alya had a spectacular Camino experience starting in Ponferrada. I wanted to thank you for assisting in many ways in making it a memorable experience. 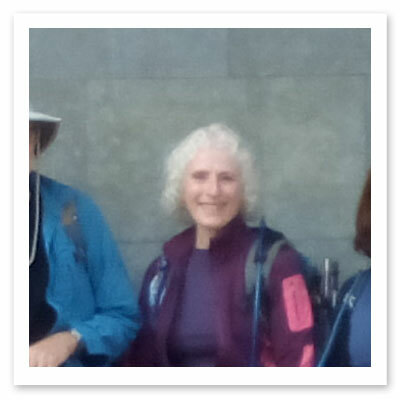 We made many new friends from Canada and Australia and the USA; tears were even shed as we parted in Santiago. 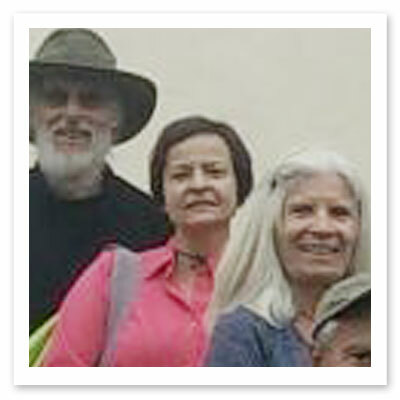 Thanks also for the surprise birthday celebration that FrescoTours made available; my 65th birthday coincided when we reached Santiago so it was a special day for me. The hotels and meals along the way were excellent. 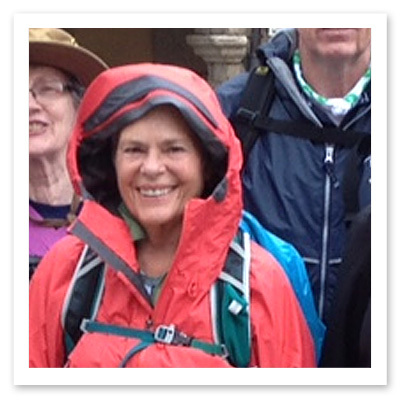 The walk itself was challenging but the months of preparation with backpacks before the Camino were essential. The pilgrim's mass last Monday in Santiago was also (by divine intervention!) a feast day so we were able to attend the noon service with the swinging of the Botafumeiro incense ritual that was extremely moving. Overall it was a life-changing and life-motivating several weeks in Spain! 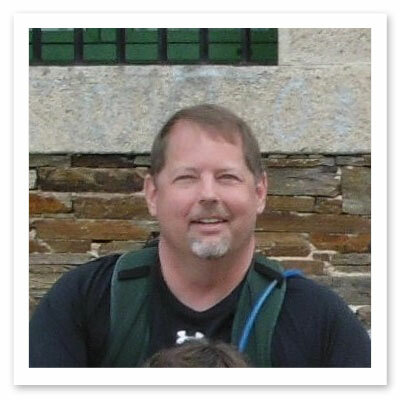 I investigated several companies offering trips on The Camino. Fresco Tours offered exactly what I was looking for. I liked their attention to detail so as to make one's journey the best one possible. Very friendly, knowledgeable staff. All communication prior to the tour was very timely and greatly appreciated. Everything on our journey was taken care of by Fresco Tours and our outstanding guides Jason and Alis and bus driver Carlos. We had a safe trip and experienced the Camino daily with many more extras than we even could have imagined. No worries as we were taken care of entirely with many additional exciting events along the way. This has to be one of the best walking tours I have ever done. A well-managed balance of scenery, spiritual and cultural immersion, food and wine, great people and good old fashioned fun. It hasn't crossed anything off my bucket list, it has just added a whole lot more things to it! So glad we signed up. We did the unguided 200km tour and it was perfect for us. Our fellow tour members were all fun with interesting stories. It was very easy working with Fresco Tours and all email questions were answered in a timely manner (even during a holiday weekend). 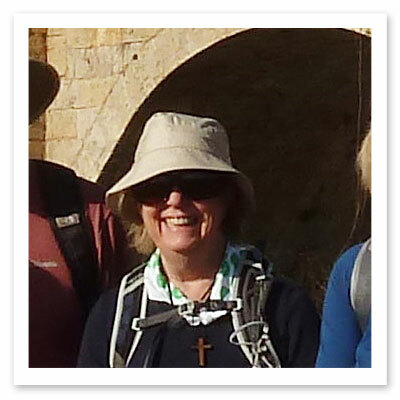 Truly enjoyed my Fresco Camino journey. Our guides, what can I say, wonderful. Friendly, helpful, patient, just delightful to be with. Missing them already. Also, enjoyed our fellow Camino walkers. Couldn't have asked for a better first experience. Thank you again for all your help before our journey. Very much appreciated. The attention to details, maps, meals and the friendly interactions with all the members of Fresco Tours helped make my Camino an incredible experience! Our group worked with Fresco to organize a Spain-taneous Custom Tour. We did a side trip to Loyola at the beginning with a guide (Jeffrey), and then he took us to our starting place on the Camino. 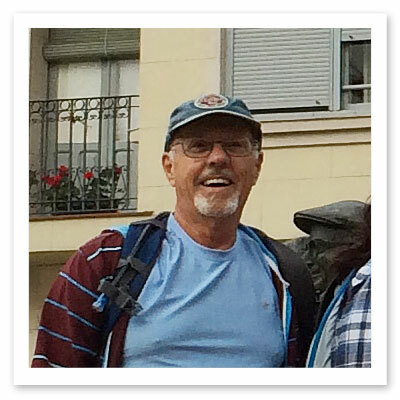 From there we did a self-guided 9 days on the Camino Frances. Since our group customized the trip, we had many questions and requests. Alex and Alissa were both very responsive and extremely patient with all of our requests. It was a pleasure to work with both of them, and I appreciated that they both went the extra mile to make sure that our group was happy. Jeffrey was an amazing guide for the short period of time he was with our group. 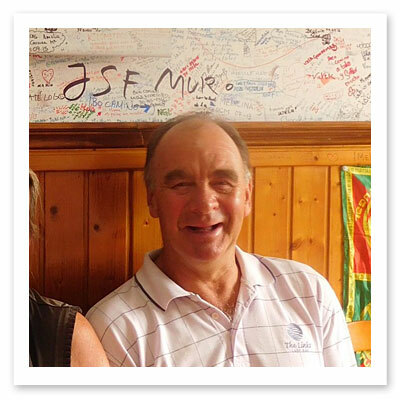 He was knowledgeable, friendly, and made sure that all of the group member's questions were answered before he set us free on the Camino. 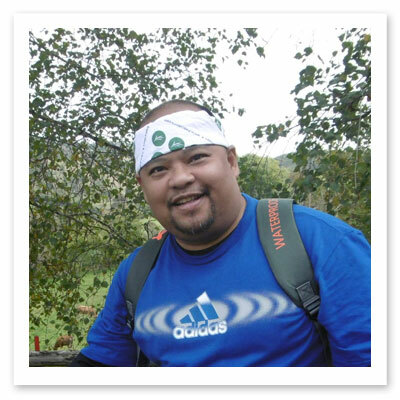 One of the things I most appreciated about working with Fresco was the friendly demeanor of all of their staff members. It is clear that they love the work they do, they care about their customers, and they want people to have a truly memorable and positive experience. 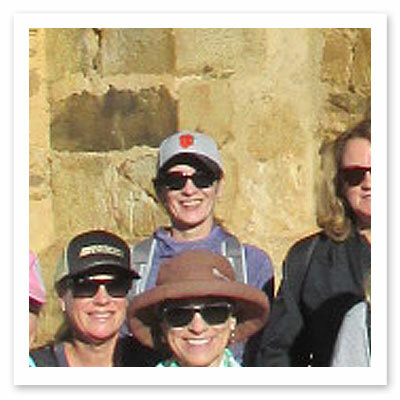 Many thanks for making our trip a success, and for sharing your love of the Camino with all of us! I am writing to you to tell that your company did a very good job with our tour. You supplied a lot of helpful information on what would expect. The hotels you chose were great. The distances each day were appropriate. 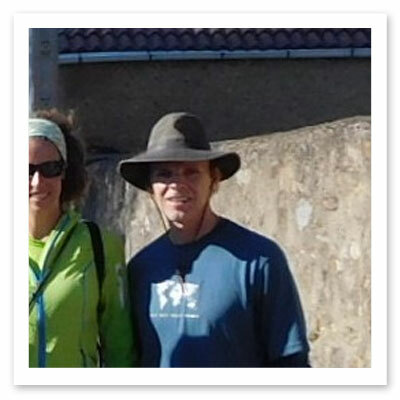 We also learned much about the Camino from Jeffery. He clearly loves the Comino. The whole experience was wonderful. I guess I can't credit you for our perfect weather, but perhaps that was your assistance as well. 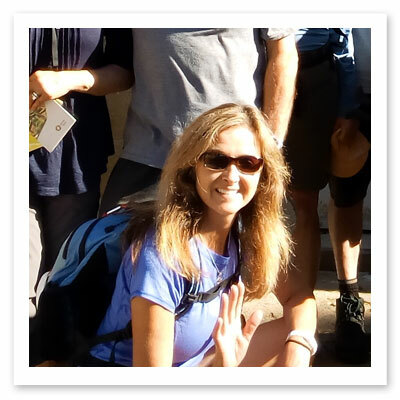 My Camino experience with Fresco Tours exceeded my expectations. Our group had a most enjoyable social time and the accommodation and meals were interesting and varied. The guides went out of their way to cater for my special diet and choices. 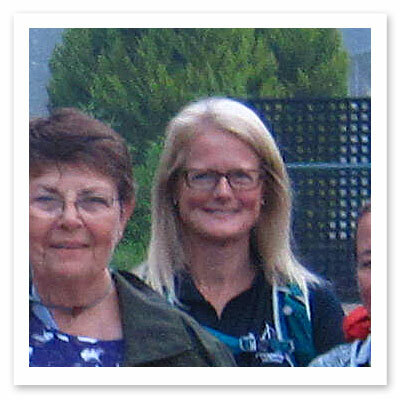 Fresco Tours staff went above and beyond my expectations in making my Camino trip and pleasant experience. 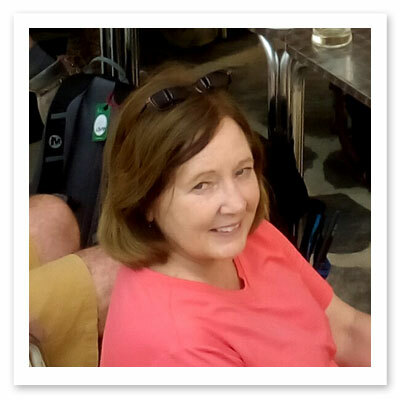 Having returned recently from my April trip I have recommended Fresco Tours to my family and friends as a Company with a warm and friendly staff that goes the extra mile for those who signed up for their tour. I will definitely fit another Fresco Tours into my schedule. You never know quite what to expect when traveling with a company for the first time, but I couldn't have been more pleased with all aspects of the tour. 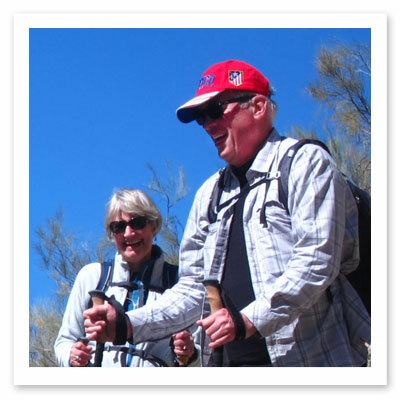 Our guides were tireless, people oriented & dealt professionally with lost luggage & multiple dietary restrictions. They are one of Fresco's biggest assets. An A+, 10+, Thumbs Up for this tour. Fresco Tour was excellent, top notch and I do and would recommend Fresco to all of my friends and family. The food was more than I expected. It was superb and I had the greatest salmon I have ever tasted in my life was in Spain. All the people I met on my tour group was great, I loved all the people I shared my experience with. It was the greatest trip of my life and I'll never forget any of you. Thank you all again for my experience. 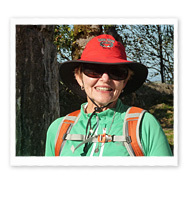 Walking the Camino with Fresco Tours is like walking with the History channel. The knowledge of the guides is always presented in an exciting and interesting way and with great stories. 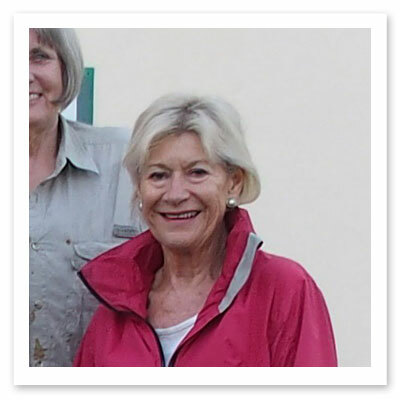 The guides are friendly and extremely knowledgeable and are always willing to go the extra mile for their clients who feel more like friends. Thank you! Just a memorable trip with lovely persons. This trip was on my check list and I'm very pleased to do it with Fresco Tours. They take care of us with nice hotels and good beds. Alissa you are the best, your help was so great. Thank you very, very much. You make a wonderful job with the people. 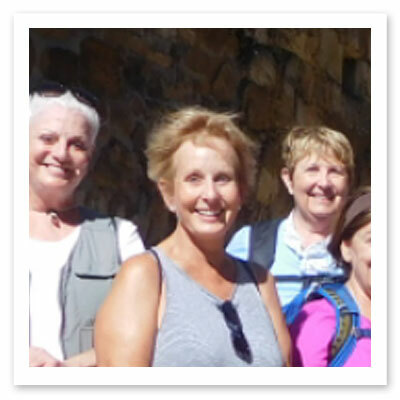 I will recommend Fresco Tours to my friends for the Camino! 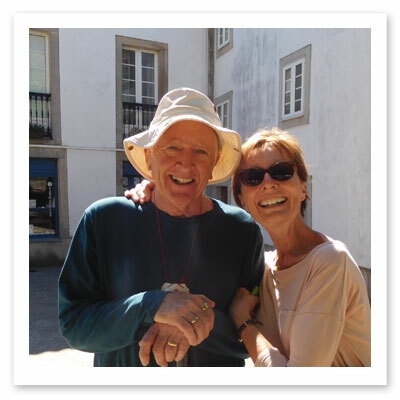 Jack and I had a very memorable Camino and we are so glad that we chose Fresco Tours. You offered so much assistance and it was terrific to meet you. Jack and I like to hike more quickly than many people, and our breaks are often short. 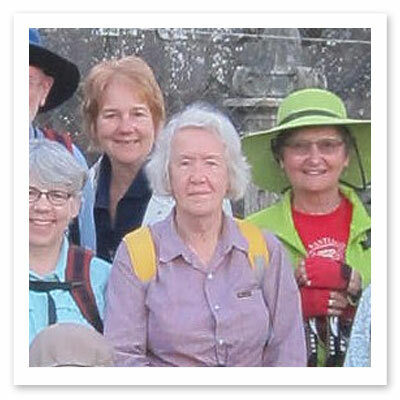 We walked at our own pace, and then it was fun in the evening to catch up with others on the tour. Excellent advice. The information from Fresco was extensive, encouraging, and very helpful. We also enjoyed the tour in Santiago de Compostela. 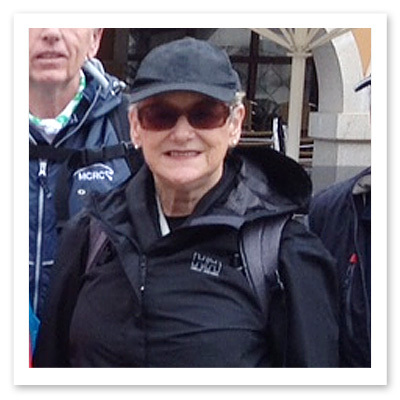 Thank you again for arranging our transfer at the start of our Camino experience. 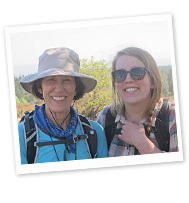 The Camino offers a life changing opportunity. It was simply marvelous! 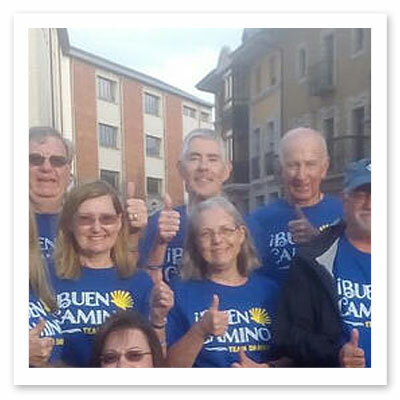 When we first started our adventure, we did not realize how important it is to have such total support for our Camino. It fast became apparent, however, just how much we relied on the professionalism (and patience) of our two guides, Roberto and Irene. Ernie and I had a fantastic time! The various places we stayed were interesting and very different; we enjoyed every one of them, even though the weather was colder than we had anticipated. The food was a delight! Ernie is still talking about how much he loved "pulpo" and I really appreciate how much Roberto and Irene were concerned about my allergy to fish, making certain I did not accidentally eat any fish. I know it took extra work on their part but I thank them very much for their care. Again, thank you all for the adventure of a lifetime. We loved it! I came along with no previous experience and not knowing what to expect. WELL - what a beautiful surprise! As guides, Jason and Jeffrey were a perfectly synchronized duo who infused their individual knowledge of the places in Spain we visited with both historical information and personal insight. And what fun the two of them were together! 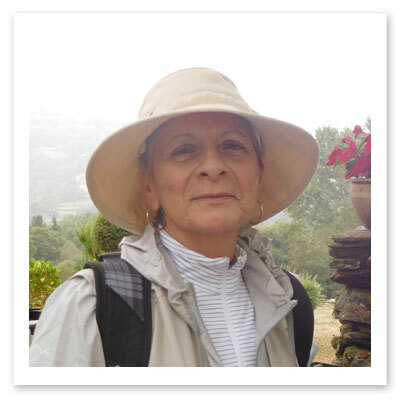 I liked the balance of urban and rural - time spent exploring the enchanting cities and villages of Andalucía and time meandering in the natural parks; and I was very impressed by the attention and care Fresco Tours paid in choosing diverse hotel accommodations and restaurants which allowed for good hospitality and rich culinary experiences. The camaraderie among all members of the group will be particularly remembered. Mealtimes were filled with lively discussions and laughter. We seemed to all genuinely like one another. And that's pretty extraordinary! Altogether, I came away wanting to plan another Fresco adventure. 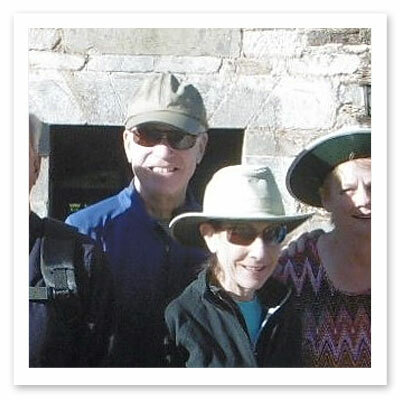 John and I had a wonderful time - everything was really "top notch" ... the hotels, the meals, the sites, and the hikes! We must give a special thank-you to our guides, Jason and Jeffery, who added so much to the trip with their warmth, humor, knowledge and generosity. They were the best! Please give them our best regards. 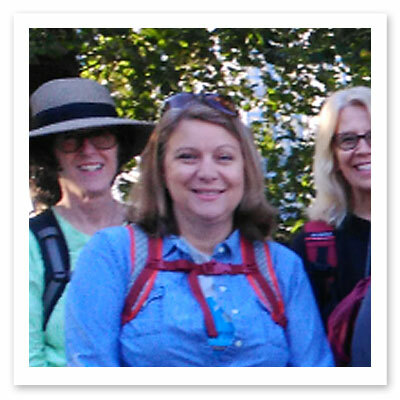 We are considering a Camino walk in the future, and we will surely recommend Fresco Tours to friends, family and others. 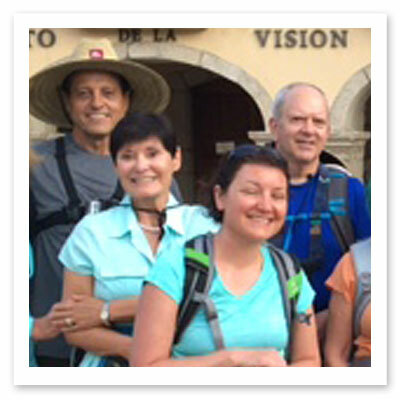 Hi Alex, Alissa, Sol, and Roberto, We are writing you today to thank all of you for a most memorable Camino. All the thought that was put into the accommodations and the local foods along with the natural scenic beauty and the historical significance of the buildings combined together made this trip truly remarkable. One of the biggest pleasures I had was letting the Camino speak to me in the simple everyday things, the bread and the wine, the conversation with other peregrinos, the ease of the local people with travelers going through their backyards. We wish all of you a very blessed Christmas season. Keep up the good work. 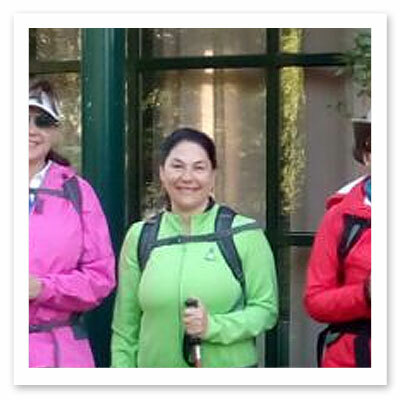 I believe the Camino is calling, see you on the trail! Hello Alissa, Thanks for your email. I had a really good time on the Camino. 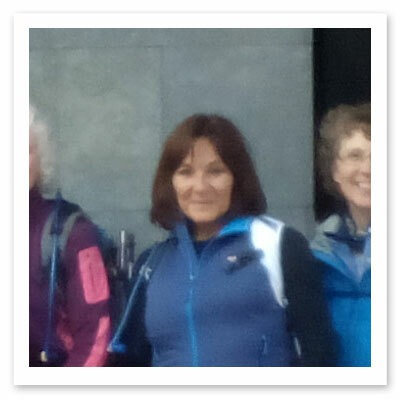 I enjoyed it thoroughly, the whole group, hotels, food, weather and of course the walking. Jason and Raúl were ideal guides. I can't think of anything that would improve it. 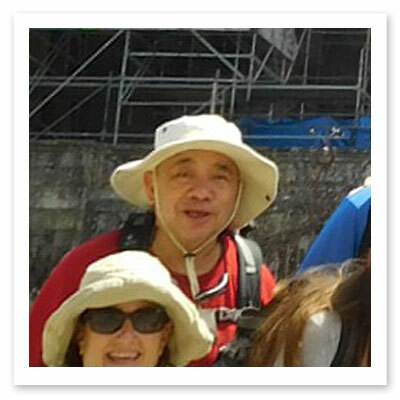 Alex, I want you to know how much my wife and I enjoyed our recent Camino. It was a wonderful vacation! Something I have always wanted to do and I was not disappointed. As much as I enjoyed the history and ambience of Spain, I must tell you that your staff made all the difference in the world. Alissa was most helpful in arranging things for us and answering all of my questions; and, the tour guides, Roberto and Sol plus Carlos were really fabulous! There was nothing that they left to chance and they handled everything so smoothly as to make it seem effortless. 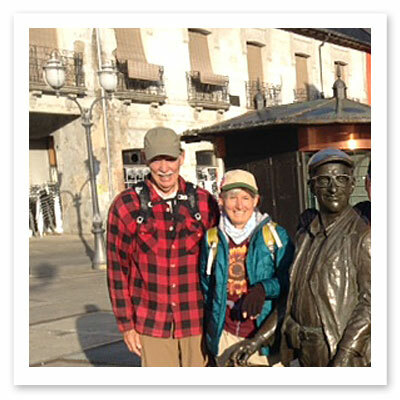 My wife "lost" her Camino credential at the end of the trip, but Roberto was able to find it and it was returned to her very quickly indeed. Carlos was unfailing kind and helpful. Everything seemed to go like clockwork on the tour. I know there some minor "glitches" as there always are, but they were invisible to us. There seemed to be no problem that Roberto and Sol could not handle. Usually their solution to a problem made the situation even better. Their attention to detail, cheerful company, and professional expertise were very much appreciated by Grace and I. We have travelled a lot over the years and they were the "best of the best." I will certainly contact Fresco again for my next trip to Spain. Viva Espana! Dear Alex and Alissa, I couldn't let too much time pass before I told you how absolutely magnificent the 2015 Portuguese Camino tour was. I don't know what I expected, but this surpassed anything I'd ever imagined. Our guides were so well prepared and informative, our driver was always exactly where we needed him, the accommodations, both food and rooms, we're just spectacular. I will highly recommend Fresco Tours, and I will definitely consider touring with Fresco in the future. Once again I say thank you for a fabulous Camino. My daughter and I had a wonderful time, enjoying the people, the food, the wine, the lovely manor homes and the spectacular scenery. 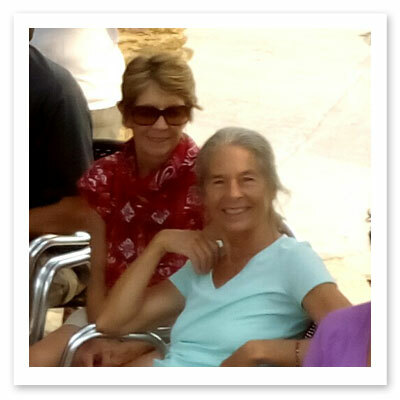 Carol and Montse were so charming and attentive, full of energy and fun. My daughter finally understood what I have been trying to describe for the last 2 1/2 years since I returned from my first Camino. It is such an extraordinary experience words are hard to find to convey your feelings. And Fresco takes care of all the details making it truly worry free. Alex, don't ever lose Alissa...she makes it all run smoothly. Hi Alissa. We had a wonderful time and everyone in our group was great! I miss the simplicity of those arrows and hope to come back someday. Jeffrey and Oscar were both great and really helpful as well. Thanks! It was an extraordinary experience and the care provided by your staff was also incredible. We were so lucky to have the best group, best weather, best guides and best bus driver that could be imagined. Alissa, First let me say muy bueno! Excellent tour. It is a life changing experience. The Galician people and culture are very pleasant and I really enjoyed them. All in all, I would strongly recommend your service. And you in particular, getting me extra nights at the hotels - thank you. Good job. Buen Camino. Dear Alex, WOW! 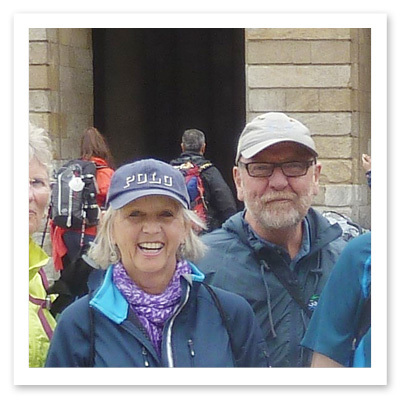 The Camino walk far exceeded our expectations...each and every day we were surprised and delighted by so many things we just could not have been happier! Please know that we would highly recommend Fresco and we would use you again. Thank you again for taking time to lunch with us in Bilbao-we really did appreciate it! AND, thanks for helping us check something off of our "bucket list"-one that is meant for the ages! 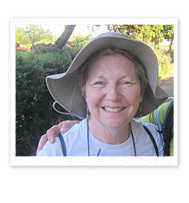 We look forward to seeing you again on the Camino! Warm regards, Patti & Milledge. 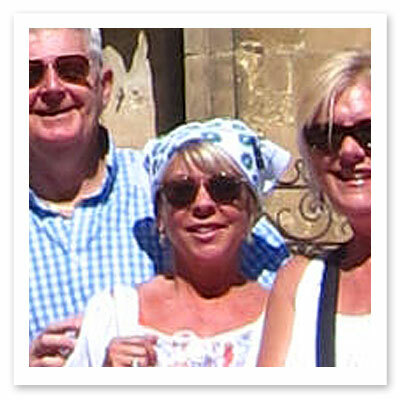 I was extremely pleased with Fresco Tours, so much so that I am recommending to 3 of my friends to join you next year. Jason and Alís were amazing. The food was excellent, the inns were unique and spectacular. The experience overall was life-changing. Thanks for everything. We have traveled a lot alone and with tour companies and you all did a fantastic job. You provided support and let us move on our own. This tour was spiritual and invigorating while enjoyable due to lovely accommodations and meals, not to mention companionship. 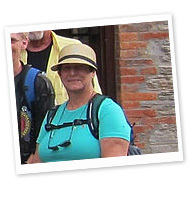 Alissa, Walking the Camino was one of the best things I have ever done and I'm sure the experience will be remembered for a long time. I enjoyed everyone in the group and we had a lot of fun together. Thank you again for an experience of a lifetime. And, thank you for all your help with arrangements. 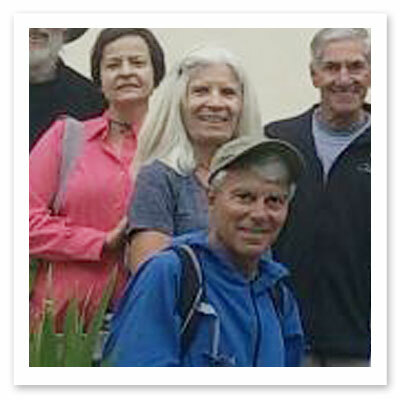 Hola and Muchas gracias to Fresco Tours, Jeff, Raul, Ana, Alissa, Pepe, and Alex! 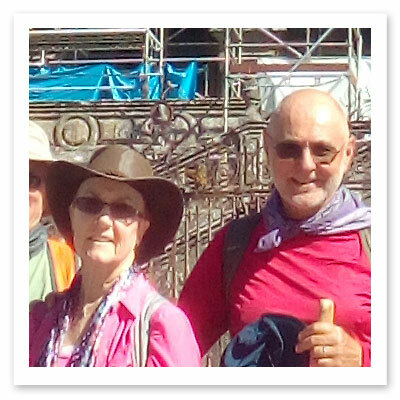 Frank and I returned home last week, thrilled with our Camino journey with Fresco. Truly, I could not have done it without you and you all made it such an interesting and pleasurable trip. Everything was first-rate. Jeff, Raul, and Ana could not have been more expert and helpful guides. The meetings each night and the maps for each day were so well done and made the next day so much easier. 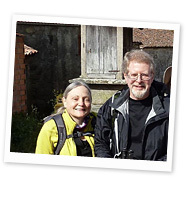 Along the way they enriched the trip with their knowledge of the countryside, its history and culture, and their unfailing kindness, encouragement, and good humor. We loved the manor hotels--and especially that we didn't have to move each day. And the food!! So much and so delicious that we didn't lose a pound. We especially loved the picnics--what a great idea. Alex and Alissa--your emails, planning and assistance prior to the trip were wonderful and greatly appreciated. Your many suggestions and help in planning our journey made it so much easier. And it was a great pleasure for me to meet you both. You are a great team and Fresco is the best! Kudos and many thanks to Fresco and to you all. Saludos. Hi Ashley, First let me say I had a fantastic time! Words cannot even express what this trip did for me. I was pleased above expectations for food, lodging and personal attention. I was not physically trained for the trip as I should have, but I felt that Jason and AlÃ­s went beyond what was necessary to accommodate me. For this, I am truly greatful! They never made me feel like I was holding anyone back. They gave me encouragement and celebrated my accomplishments. For this, Jason and AlÃ­s will alway have a special place in my heart! 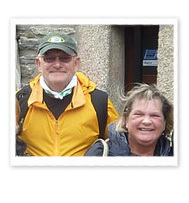 I would and do recommend this tour company for anyone who wants to travel the Camino de Santiago. I hope to do it again with my husband. Thank you and Buen Camino! Hola, Fresco Tours! 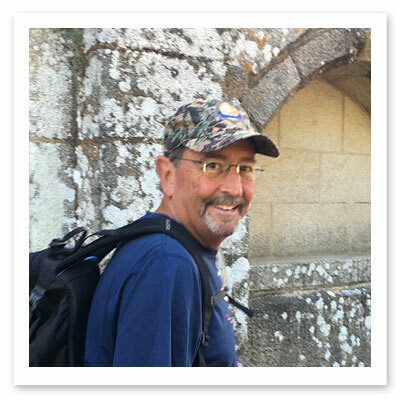 My Camino experience was absolutely wonderful, and much better than I had anticipated. Many thanks to Fresco Tours for the wonderful service that you provided to me and our group. The written materials and maps were superior. Our bags were always delivered as scheduled, and the accommodations were very good. Jeffrey gave an excellent orientation on our first night, and sent us off in good spirits. Many of our group had wonderful comments about how good the communications from Alissa and Ashley were. 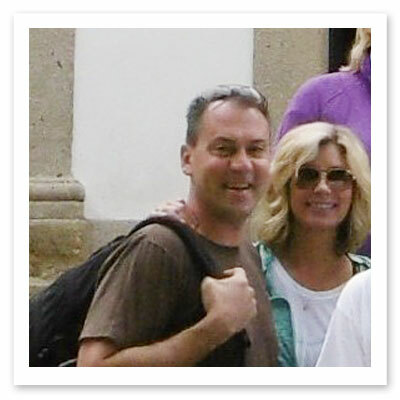 Ashley helped my wife meet us in Santiago, and the coordination with the hotel was seamless. Since the tour has ended, I have recommended Fresco Tours to a number of people. Thank you very much. Alex, We had a wonderful time on this tour, and have many good things to say about Fresco. Our guides, Jason and David, were great, and we all 'loved' our driver, Carlos. Jason and David helped us understand what we were seeing in a way that we could not have done on our own. The lodging (especially the country manor homes) and meals (picnic lunches included) were wonderful. The whole experience was well-organized and still gave us time to be on our own. The best part was that the scenery was lovely and we really enjoyed seeing this part of Spain in a way we could not enjoy it any other way. Alissa was awesome in helping us with some special arrangements. And we loved our excursion to Finisterra. It was a great way to end the trip. 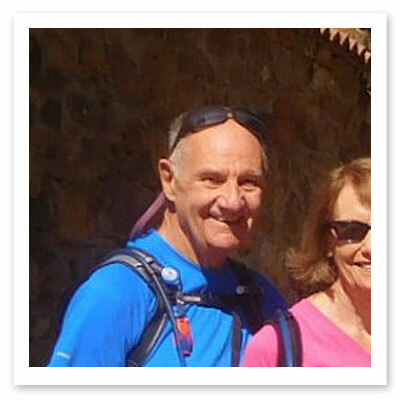 We hope to hike the Portugal way up to Santiago with Fresco in a couple of years. Alissa, Thank you so much for making all of our extra arrangements for the Camino trip. Your patience and prompt response to all of our inquiries was so appreciated. You made our holiday so stress free and pleasant. We cannot thank you enough. Even letting me practice my Spanish on you! (I've decided to re-enroll and pursue this second language skill due to the encouragement that you and Ana gave me). Muchas gracias; tuvimos una experiencia maravillosa en el Camino. Deseamos a usted y a su familia lo mejor. Hola Alex, thank you so very much for a wonderful trip. For me this was a trip of a lifetime and I will never forget it or your company. You people from Fresco made it possible. I don't think you can make it any better. Since I am back home, I haven't stopped talking about the Camino and Fresco Tours. Jason and David were the perfect hosts and guides. They are a great asset to your company. Loved their cooking. I felt being protected by "Mother Hens". Even though I am back into everyday life, the Camino is still very much in my mind and not a day goes by I am not thinking about my walk. It left a very big impression on me. Thanks to you and your staff this trip was a great success. Also thanks to Alissa for making all the hotel reservations. Saludos from Colorado and Muchas Gracias. Hola Alissa, We want you and all the Fresco people to know that our tour was wonderful. Jeffrey, Raul and Ana were terrific, helpful and knowledgeable and very caring. The picnic lunches were the absolute best. So thanks to all of you. We will recommend Fresco to all our friends. A special thanks to you, Alissa, for all your help. Hola Alex, 10 +, A+! It was a great tour with lots of essential ingredients: beautiful visuals, interesting walking - an intro to the Camino - and of course, excellent food. We're finally having a moment to sit and enjoy the pics! 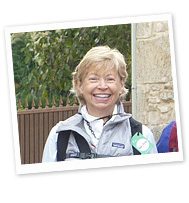 The trip was beautifully organized and we really appreciated having you as one of our guides. Thanks for providing a first rate experience, Alex. You deserve to be very successful. We'll be sure to recommend you and hope to meet again. Thanks again for all the attention to details. Hi Alissa & Jason. 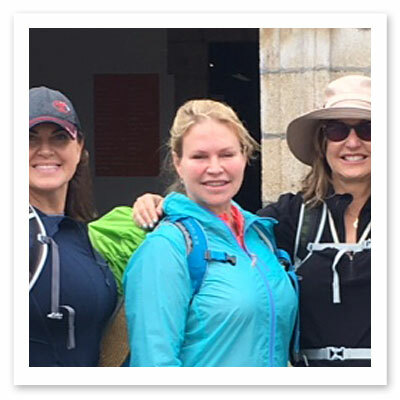 My overall Fresco & Camino experience was more than positive and I am grateful to Fresco Tours for the well-planned itinerary and accommodations along the way & pulling together a fabulous group of people. We have all become friends and the camaraderie was so fun and pleasant all the way!! I would definitely recommend this tour to others and in the future, I will most likely check out other tours that you offer. Lastly, it was such a pleasure to enjoy Jason's introduction and company for the first evening and to start us out walking...he added the first good touch and I sure enjoyed being 'wined and dined' to start!! Muchas Gracias and Adios. 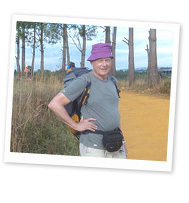 Dear Alex, Richard and I have safely returned from our amazing Camino. 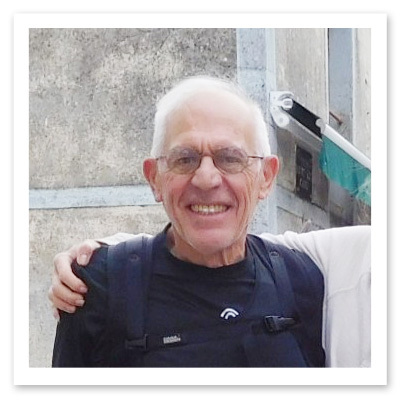 Thank you so much for your guidance and kindness during Richard's illness in Villafranca. We are so grateful for all your help and it was very reassuring to know you were only a phone call away. 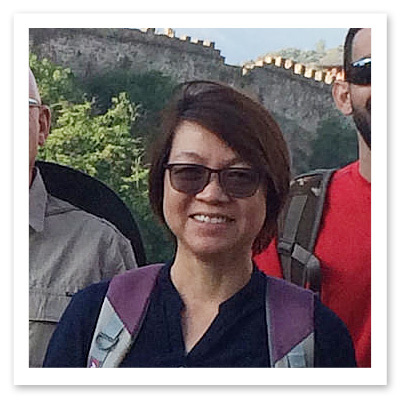 You went above and beyond with your frequent calls to check in with us and to ensure the logistics of our hotel accommodations and transport of our luggage. Now, where do I start with the entire journey? 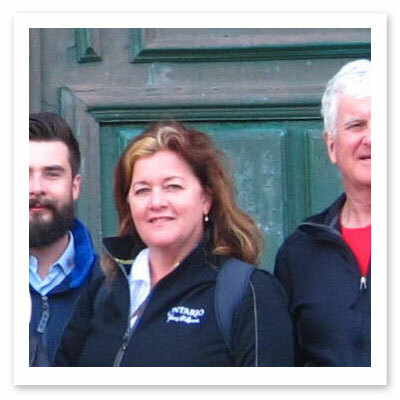 We have the highest praise for Fresco Tours from the initial email contact, all the assistance from Alissa, Jason's orientation with helpful tidbits, a phenomenal welcome dinner and a great walk out of Ponferrada to the actual self-guided tour. You provided exactly what we needed along with great places to stay and wonderful food recommendations. I don't know how you did it, but you put together the most wonderful group of ten people; all who enhanced our amazing journey and whose friendship will enrich our lives. 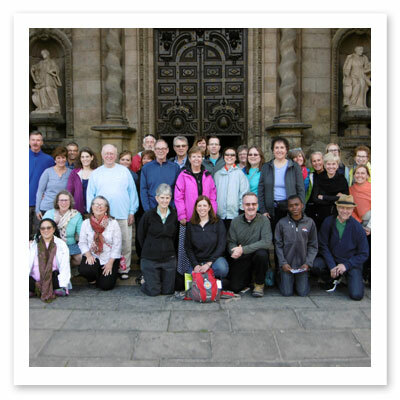 You and all at Fresco Tours embody the spirit of the Camino and we thank you! Thank you, thank you, thank you, Alissa and everyone at Fresco! I have been home since Friday, with a big HUGE smile on my face. 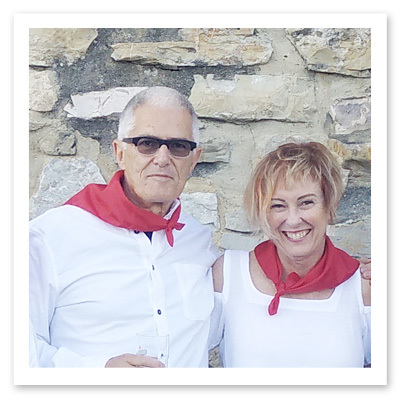 I had an absolutely fabulous time in Spain, and will definitely recommend Fresco to others, and if I'm fortunate enough to Camino again, will look into Fresco first. You guys are the best! Thanks again for the lovely experience in Spain! 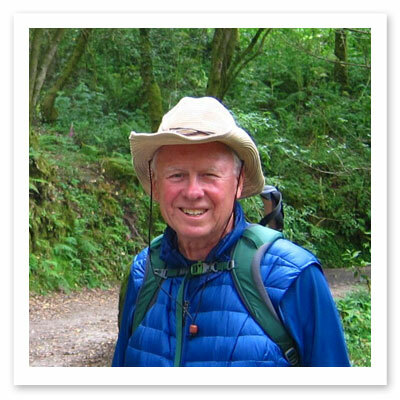 Dear Alex, Thanks so much for introducing us to the Camino. Your enthusiasm, experience, and energy made for a truly memorable trip. We'll always look for the yellow arrows! Affectionately, Martha + Murray. You guys deserve a lot of credit for a truly fantastic two weeks. Unknowingly, you put together nine of the nicest, most interesting people together for an absolutely unforgettable experience. Many, many thanks. The pilgrimage was so special. I absolutely loved the trip- the walking, the food, the camaraderie, and the kind care we received all made for a wonderful experience. And I also found it to be quite spiritual as well. Everything about it was perfect and Jeff and Irene were perfect hosts. Dear Alissa & Alex, Our Fresco Tour ended yesterday. 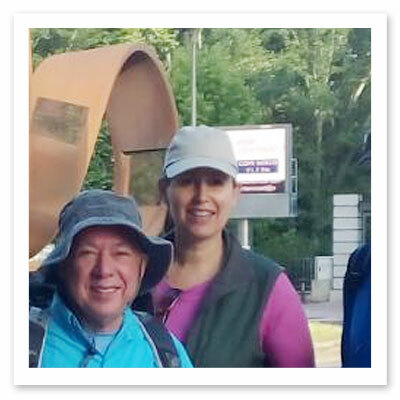 What a wonderful Camino we had - we managed to walk the entire 200 km! Getting to know the other pilgrims in our group, our first day with Jason (the traditional dinner was over the top), and all the adventures along the way will provide interesting & amusing topics for conversation for many years to come. Thank you SO much for arranging for us to stay in a special room at the hotel in Santiago. 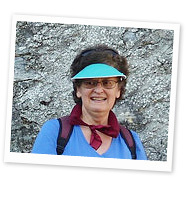 Thank you not just for ending our Camino on a very positive note, but for all your assistance prior to the trip. We really appreciate everything and have only very good things to say about Fresco Tours. Hi Everyone, Wow... what a great time we had! A really nice group of people to walk with, eat with, and share our first Camino experience. Jeff and Irene were excellent. We were guided, educated, diligently looked after, taken care of, wrangled, and fed, with great attention to detail. No small feat on their part. Manuel was always at the right place at the right time.Thank you all for your contribution to a wonderful experience. 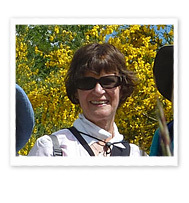 Dear Alissa, I would like to thank you and Fresco Tours for the wonderful experience I had on the Camino. Your information was terrific, especially the maps. It is reassuring to know where the next services will be. The accommodation was good - always clean and something you looked forward to at the end of the day. My hats off to the company who transported our luggage. It was nice to discover our luggage in our room, especially when there were steps to contend with when no elevators were available. It was also nice to know that the hotels and transport company picked up after us, even when we had done our own quick look around the room. I was very thankful, as I had left my journal behind one day without realizing it. Thank you again for the wonderful experience. Alissa, It was great to meet you during this amazing trip. I have to make a point of complimenting our guides. I give them both 5 stars, and hope they stay at the top of the Fresco guide list. Jeff was very knowledgable, accommodating, and fun. 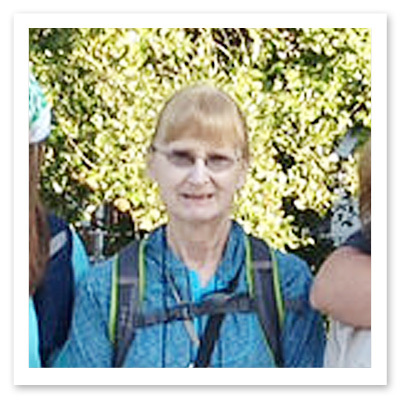 There was a broad range of walkers in our group, and he and Irene juggled everyone and their needs quite well. Irene was fabulous as well. 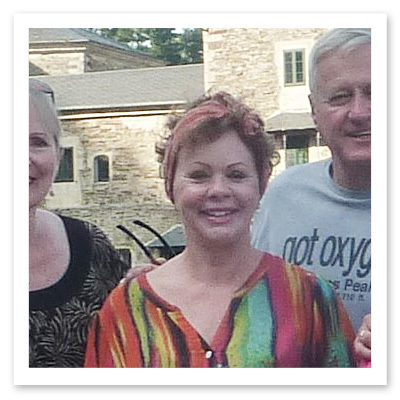 She was joyous, funny, a good sport, and she worked hard to make our trip a fabulous experience. 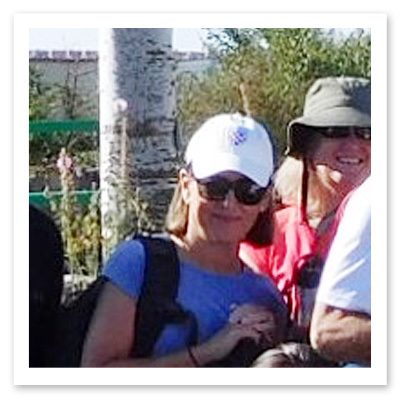 Buenos Días Alissa, I thought the 200 km walk was really quite good. I enjoyed meeting Jason and he set us up on the right foot. The first night's meal was outstanding and an excellent way to get to know everyone. Hola, A memorable adventure. 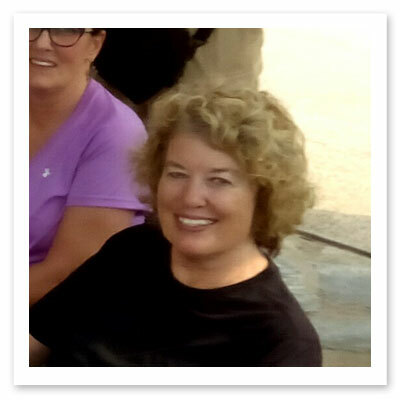 Excellent leadership; quality accommodations; compatible pilgrims; knowledgeable, caring and patient tour directors; and, an enjoyable, educational and delightful experience. 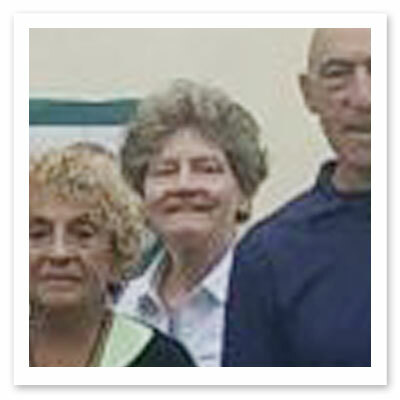 Jeffery and Irene were outstanding; Jeffrey's knowledge of the area was excellent and Irene's attention to our needs was appreciated. Alissa's attention to all are requests was greatly appreciated and comforting. If the opportunity arises, I will be joining another Fresco tour. Ciao tutti, Frank. 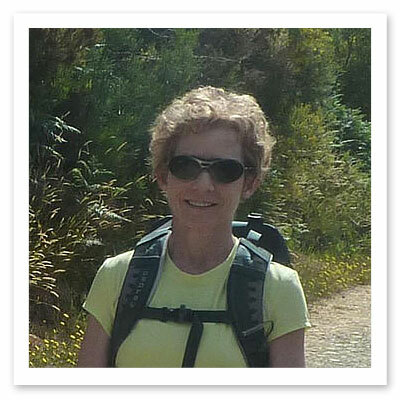 Hi there, I thought the Camino was great! I enjoyed the walk, the food, and the facilities. I was impressed on the facilities on the walk as they were all very clean. I would encourage more of my friends to do this. It was a wonderful experience. Thank you very much! Hi Alissa!!! I had a WONDERFUL time and experience. I was especially pleased with the awesome luggage transfer service. One day I had forgotten to pack my book and the hotel must have found it before the bags left because they placed it in the side pocket of my backpack. I hadn't even realized I forgot to pack it until I saw it was in the side pocket! That was great! I really really really enjoyed my journey. Thank you for all your help! Hola Fresco Amigos, we're just back home after a great adventure in your lovely country. 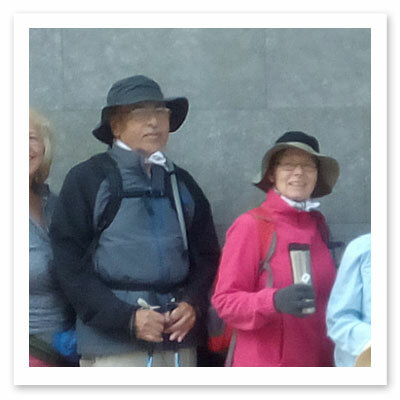 Thank you so much for the photos and everything you did to make our Camino a great experience. Roberto and David are the absolute best at what they do. 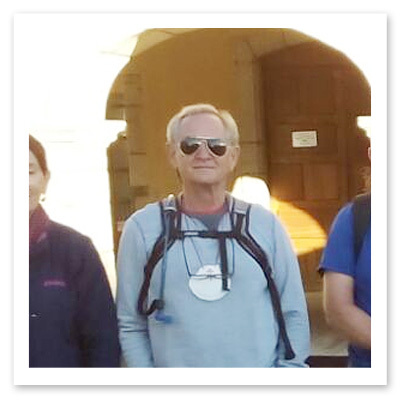 We will recommend Fresco to anyone interested in a walking adventure and hope to take another tour with you one day. 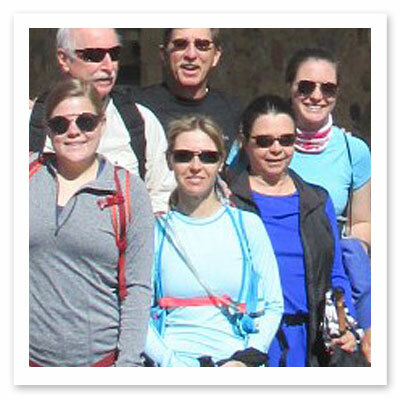 We will definitely recommend Fresco Tours to friends and family who may want to walk The Way. Thank you for all the planning you did to make our pilgrimage one to always remember! Muchas Gracias. 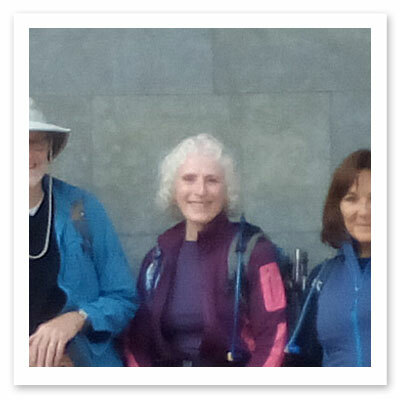 And finally, I now realize that even though we walked to Santiago and finished in Finisterre, our Camino has not ended. It will continue for the rest of our lives. Alissa, I have nothing but praise for Fresco, David, Roberto and our amazing adventure. I will return. We are already talking about our next trip. Thank you for making our pilgrimage meaningful and enjoyable. Roberto handled my allergic reaction on the first day calmly and efficiently. David was kind, calm and helpful. He stayed with me and translated for the doctor and me. I owe them both a huge debt of gratitude. It was a heck of a way to start a vacation, but the rest of the trip was thankfully uneventful and I knew that whatever happened I was in good hands. If you give bonuses for above and beyond the call of duty, David and Roberto get my vote and my gratitude. Thank you. Dear Alissa, I just want to thank you for planning a wonderful trip for us as your 'legwork' made our 'legwork' doable. I watched The Way when I got back and felt that my experience was as meaningful as the experiences of the characters in the movie. I just may come back to do earlier legs of the path with Fresco Tours. I did not realize I was going to become such a walker in the last part of my life. Thanks again. 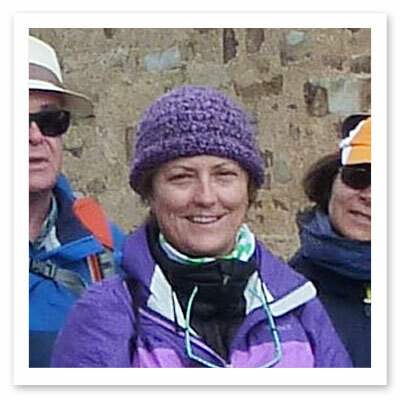 I had an amazing time on the Camino. David and Roberto are amazing, beautiful people. I will certainly be coming back. Thanks for everything! Hello Alissa, Roberto, and David, You all did a fabulous job and made our pilgrimage so enjoyable. We have traveled often and returned more invigorated from this experience than any other. Alissa, thanks for your patience as you answered all our questions prior to arriving in Spain. We are so glad that we got to meet you while there. We enjoyed each of the hotels/manor houses and the ability to spend more than one night in a location. Roberto and David, we appreciated your knowledge, humor and attention to our wishes. You work really well together. Thanks for making the Pilgrim mass in LeÃ³n and the Sunday mass happen, making us feel like true peregrinos. The lunches on the Camino were a highlight. We also enjoyed experiencing local specialties. After leaving the hotel in Santiago with only the hotel map, we realized how valuable your map of Santiago was. Again, thanks! Hola, Ashley! Our trip walking the Camino could not have been more wonderful! The weather was perfect, the accommodations along the walk were very adequate -( the manor home was spectacular!) and the group was family by the end of the tour. We really appreciate your help in making our trip so special. Thanks for adding hotel reservations to both ends of the trip and for getting our train tickets. Overall, this trip far exceeded our expectations.Thank you so very, very much for helping us experience this most wonderful trip! 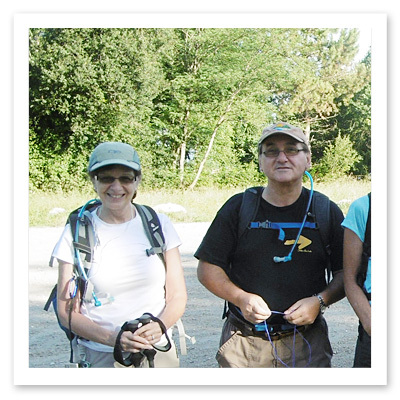 We hope to walk the Camino again and will definitely promote Fresco Tours to our friends. Wishing you our best. Good afternoon to all! 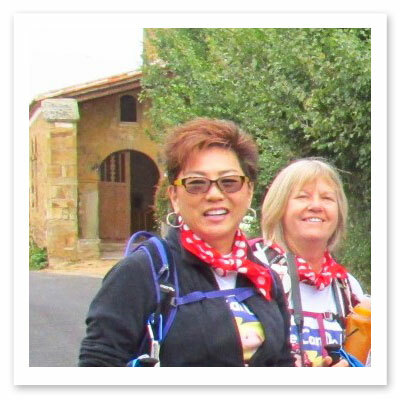 I would like to thank Fresco Tours for the entire Kinder Camino experience. The entire staff of Fresco Tours must be one of the best around. Thanks to Alissa for all the work that was done coordinating everything, including some last minute hotel arrangements. The guides Roberto and David went beyond what you would expect. The food, wine, friendship, tours, history lessons was way more than I expected and I thank everyone one of you. I'm hoping to sign up for another Fresco tour in the near future and will recommend to all my friends that they consider your company when they plan to travel again - thanks to all! Hi Alissa/Alex, Fantastico!! Back in the real world now but still living the 'camino'! For me, it was a truly wonderful experience and one that I hope to repeat. It is hard to put into words what walking the Camino does to you/for you, but whilst trying not to sound trite, becoming one with yourself is definitely a part of it (and physically, my blood pressure on return is the lowest it has been for years so something definitely happened!) In terms of Fresco Tours - brilliant! You could not have been more helpful, the initial orientation meeting and then setting us off on our way were perfect, and all the accommodation was great - that little bit special. Thank you. I would recommend you without hesitation and if there is anything you think I could do to promote Fresco Tours over here in the UK then just let me know! Keep up the wonderful service and I'll forward to booking again in the hopefully not too distant future. Muchas Gracias. 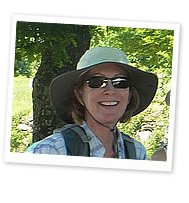 Hi Alissa, A big thank you for a great walking tour on the Camino. Good accommodations, they were fabulous. Well I know you don't pick the other tourists, but this bunch of Americans were truly wonderful folk and I have made many new friends. Also a good word for the helpful staff at the hotel in Santiago. Hope the rest of your tours go well this season. Best wishes. 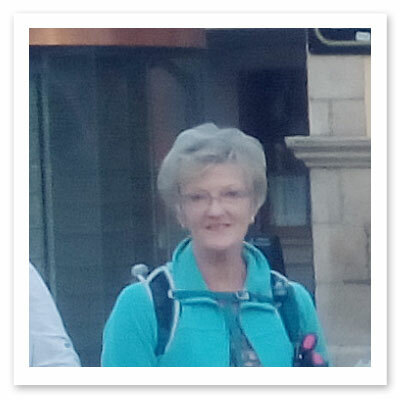 We enjoyed our walk and our hotels, especially the one on the third night of our walk. It was beautiful and the food was outstanding and not that expensive at all. We appreciate all your help. This journey was one that enhanced my spirit religiously, personally, and spiritually. We are so glad we did it. You couldn't have been more helpful. Thank you! 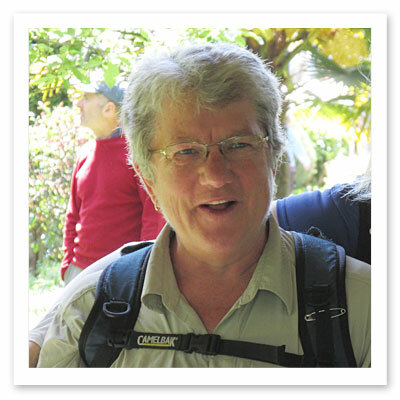 If you have doubts about being able to walk the Camino, Fresco Tours is the group you've been looking for! This organization offers very timely information about how to prepare for this arduous journey. We did the self-guided tour, and the hotels that were booked were wonderful--such a relief to have your luggage and a bed waiting for you after a long day's walk! Also, when we did have a few traveling hiccups, both beforehand and along the Camino, Ashley stepped in and was a lifesaver! 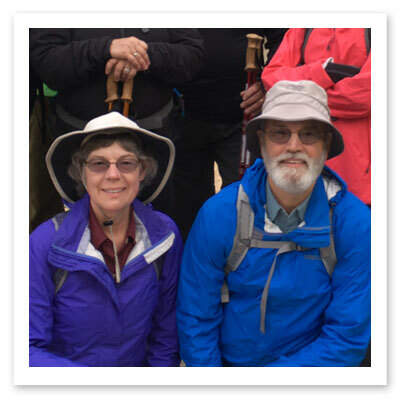 All in all, we walked 130 miles of the beautiful Camino de Santiago--but this doesn't even begin to communicate what a life-expanding experience this truly is. I'm already planning to return next year to experience this wonderful journey with my son. Hola - Hello - Bonjour - Kaixo, Once again Fresco Tours has delivered. Being single and female always comes with a few doubts. After travelling with Fresco last year on the Camino de Santiago, I knew my trip would not be disappointing - no more doubts. The pre and post travel and hotel arrangements coordinated by Fresco Tours could not be better. This Fresco Basque tour was so different in many ways. The scenery was beyond my expectations, and so was the food and accommodations. I will never forget entering the town of San Sebastian nor our hotel in Getaria. Once again, our team leader Jason was full of knowledge and history. 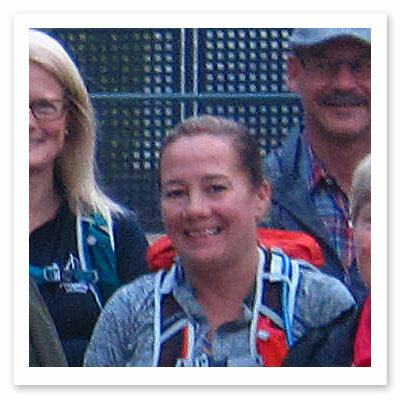 It was always a pleasure to see that smile at the end of the day when you finally arrived at the meeting point. 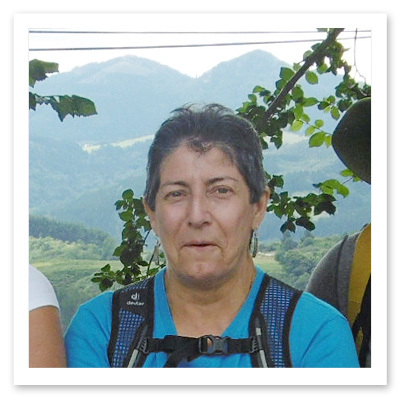 As for Sol, her passion for her Basque heritage brought the countryside (and politics) alive. Before I forget, say thank you to Sol for the chocolates at the noon day picnics. A pilgrim can never have enough chocolate after climbing for four hours. 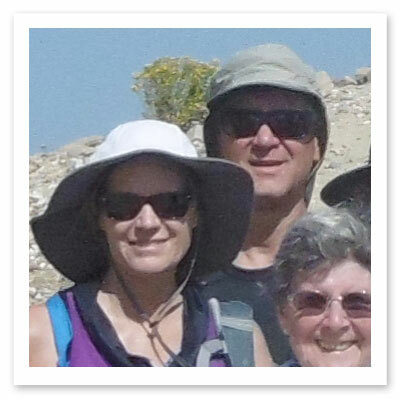 Both guides were very professional and I must give them and Fresco Tours many stars for going above and beyond in regards to recovering our fellow pilgrim's lost passport. Speaking of fellow pilgrims, they were the best. The dinner at the cider restaurant, the tasting of the Txakoli (wine), pinchos (aka tapas) and the visit at the Rioja vineyards were memorable. I am now looking forward to booking next year's tour with Fresco. I hope that the Portugese tour is still available. Even though Fresco provides guided tours, I still feel that both trips were a journey rather than an adventure or vacation. Both were good for the soul. Gracias - Thank You - Merci - Eskerrik Asko. I stayed with Fresco following my initial contact with Ashley - I immediately knew I had picked the right company! Ashley was wonderful. 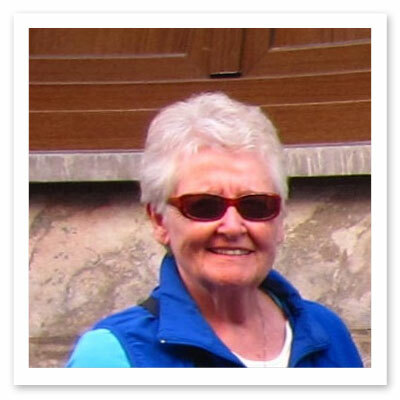 She arranged my trip and booked hotel rooms before and after my Camino in addition to getting my train ticket for me. I don't think I could have done any of that on my own. 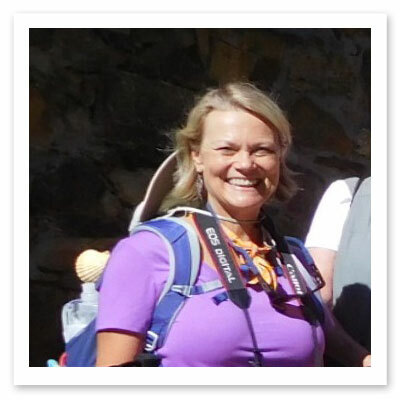 I owe the success of my Camino to Ashley! My motto is Five-Star or stay home. This definitely lived up to my expectation. Our expectations were exceedingly met. Everyone involved at Fresco Tours does a great job! Thank you and we will be back! 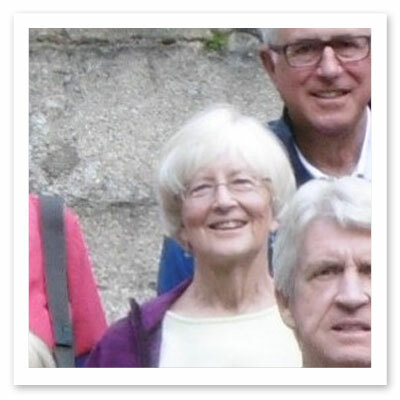 Dear Alissa, Our family members are all back in America now - in good health - and with fond memories of our wonderful Camino tour. 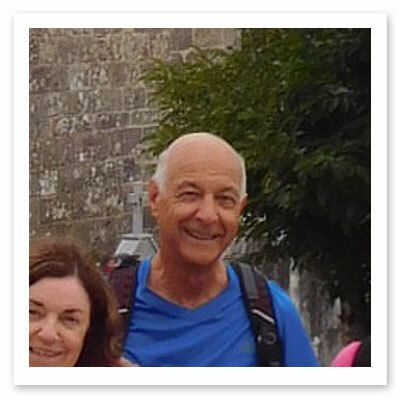 I wish to thank Fresco Tours, Alex, and you personally for making our time together in Spain and on the Camino so special. 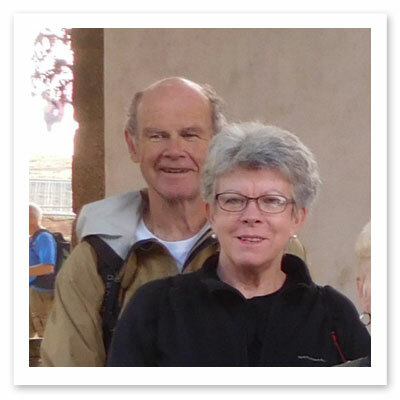 Our accommodations were excellent in Madrid, at each of the hotels & pensions on the Camino, and in Santiago. Roberto and Pedro were both knowledgeable and helpful, as were the printed guides and maps provided by Fresco. All of the arrangements and transportation occurred precisely as scheduled - no glitches. Also, the scenery between Sarria and Santiago was much more beautiful than we had expected - and the weather was perfect. 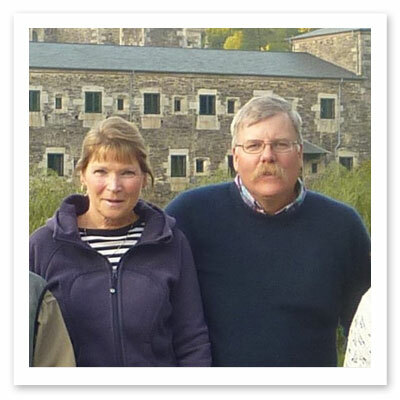 Thanks to you and Fresco, our family will cherish our Camino experience as a highlight in our lives. We will certainly recommend Fresco Tours to anyone wishing to visit Spain. Saludos from America. 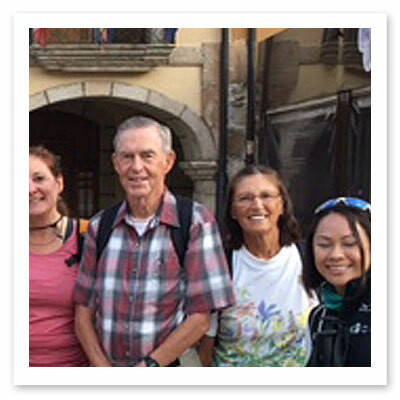 Hola Alissa, We just wanted to let you know that our Camino de Santiago de Compostela was a super wonderful experience for us, including the J-girls from Osaka. We enjoyed every single day of the Camino - delicious picnic lunches, comfortable lodging with history and character and hospitality, food and wine, and of course the local beers! Kumiko, Akiko and Midori went home with memories they will cherish for a long, long time - this trip was totally different from any trips they (and we) had made- because the trip itself had a specific objective, and when it was accomplished at the Santiago, our hearts were filled with that sense of accomplishment. I have no doubt that every one of us left Santiago as a happy camper. 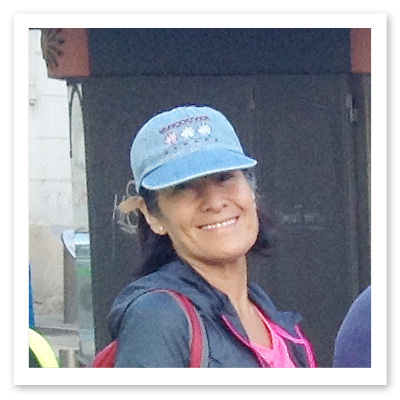 As for our family, thanks to your recommendation we took bus from Santiago to Viana do Castelo, then to Porto. Both rides were comfortable and easy, and of course we had some great times in each city. Thank you so very much for your great help! Please send our best regard to our wonderful leaders, Sol and Carol, and the excellent bus driver Manuel. They all did the outstanding jobs! Hi Alissa -- we had a wonderful trip! Thank you for doing such a great job arranging it. Fresco has itself a repeat customer, and I will be coming back in two years to do more of the Camino. You made everything very easy and were very helpful when we had questions in Spain. 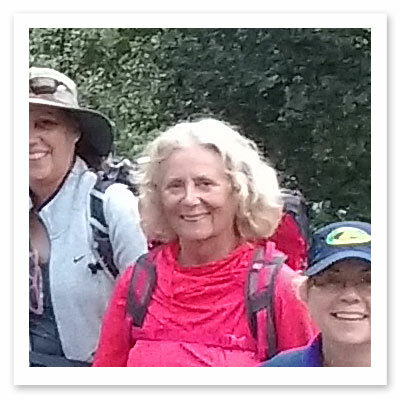 I am home and still glowing with the experience of walking on the Camino. I felt that the information that you provided was excellent. 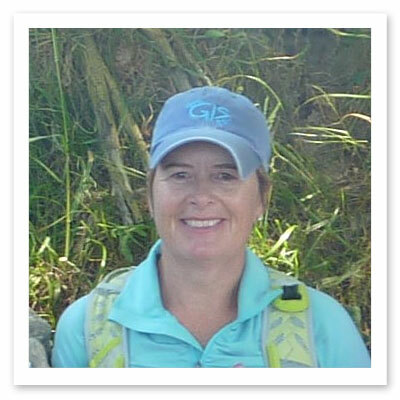 Both Lisa and I felt that the guidance was just what we needed to get started and to know what to expect each day. The country manor homes were beautiful and we were able to have a massage therapist in to work on our backs and legs at one of them. Overall, the hotels were great. The ride from Santiago to Sarria went smoothly. Our driver was there when we arrived and got us safely to our hotel. So, many thanks for a wonderful experience! Alex & Alissa, I wanted to first thank you once again for the superior service that you all provided. We loved the itinerary, the locations that we stayed and our guides. The pre-travel assistance was greatly appreciated. Everything went very smooth and made our vacations a great one. The extra effort your team provided for my mother-in-law as very much appreciated. I know they would have done the same for anyone. But it was invaluable and much appreciated on that first day especially. The friendship and encouragement were always welcome. The birthday cake and gift were over the top. 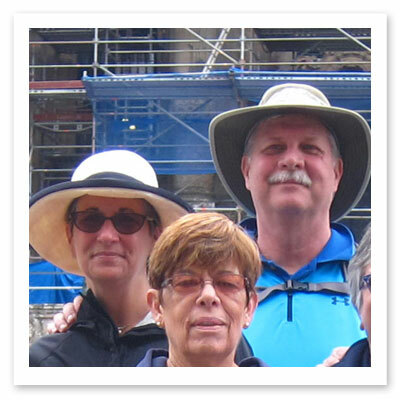 Thank you Jason, David and Irene: as always you've picked a great team of folks to represent Fresco Tours. They were informative, supportive and the food they prepared was excellent and presented well. Christine and I really want to say thank you for our night in the honeymoon suite. I wish we could have had a little more time there. I look forward to the next time. Thank you! Good Morning. We have arrived back and appreciate all the support in doing so. Fresco more than exceeded my expectations. Everything was operated as expected. Jason is a real pro. His knowledge , attitude and sense of humour made the trip a real success. 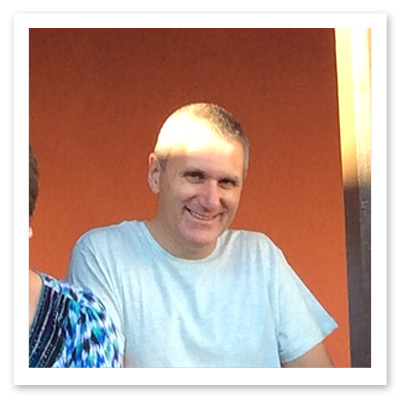 He is the heart and soul of Fresco. David was fantastic. Good sense of humour as well. Irene will do well, she has a great attitude. The food and wine were spectacular. Accommodations were very unique . Routing was good. Overall, I would give it a ten. Thanks again for all you personally did. Alissa, I believe Fresco has done a great job supporting us from the time we began to sign up for the tour. You and others did a wonderful job helping us for over one year. 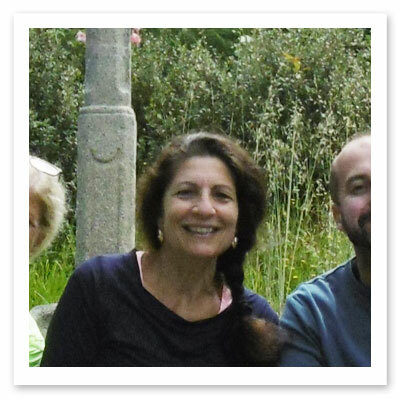 Alissa, you were our primary contact and you were just great with your support. Always prompt, courteous, and providing answers to our inquiries. I know others were involved in supporting us and I thank all of you together. Everything about the journey was well done. Nice hotels with good service and breakfast. Suitcases delivered promptly. Jeffery gave us lots of good information before the walk began. I think your group works very well together. Best wishes to you and all the staff at Fresco. Un abrazo. I had a fantastic time and would join Fresco Tours again or recommend it to family and friends wholeheartedly! I love every aspect of the tour and your attention to details really showed. I'm already thinking about doing it again next year. Thank you SO MUCH Fresco Tours for an outstanding job! I truly appreciate everything you have done!! Dear Alissa, I had a fabulous time. Jason, David and Irene were charming, knowledgeable guides who kept us on track, well fed, amused and entertained with stories and anecdotes, history lessons and much more. The lunches they prepared were fit for a king (or queen). The dinners were great too. I thought the accommodations we stayed at were excellent. I am recommending Fresco Tours to everyone who asks me how I enjoyed my vacation ? I hope you see a few of my friends in the future! Thanks again for a fabulous time, please give my regards to Alex, Jason, David and Irene. 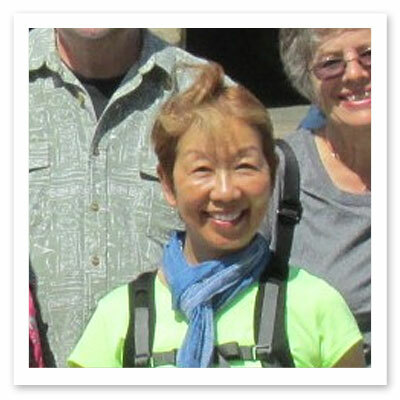 Greetings Fresco Tours, Thank you for arranging a seamless adventure for the travel part. Accommodations were comfortable considering availability & the intimate little villages in towns available along The Camino. Preparation is definitely key! The Camino is a lot more than people think & it is definitely more than a spiritual journey of the soul. 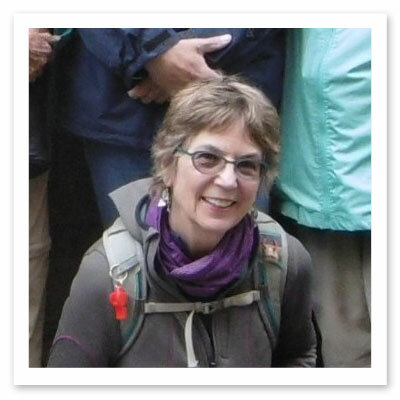 I needed to read a lot more, and perhaps speak with more people, as the perception behind The Camino and actually walking it are two different things. I liked the intimacy of a smaller group. Friendships were made that became family. It was extremely rewarding & only made possible by a smaller group of people. I hope to be able to walk it again. 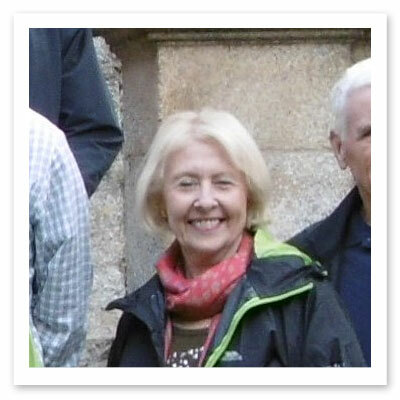 Thank you for arranging a lovely tour for The Camino adventure. Hola Alex, Another super trip, thanks to you, Jason, and Manuel. Everything worked beautifully, and you will not be surprised that people were delighted with all the logistics and with Jason's great knowledge, patience, charm, and picnic-making. The flexibility of walking/riding options were greatly appreciated by those who chose to mix it up, day by day. 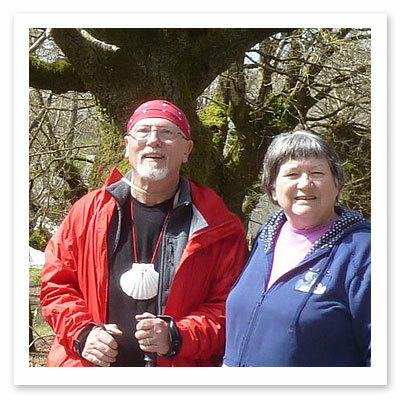 We would very much like to do the Camino Portugués next year! I wish you a great summer and continued success. You have a great gift and have surrounded yourself with a terrific team. 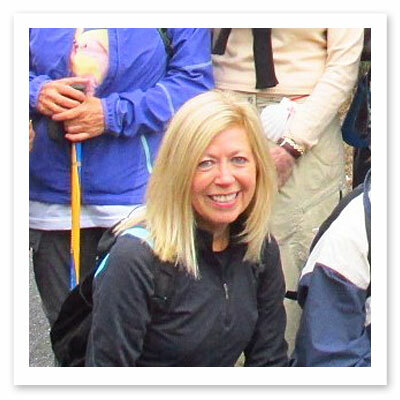 Alissa, Thank you for your help and the support of the Fresco team for our group's walk along the Camino. We had a wonderful experience, perhaps a little more challenging at times than we expected, but so is life. I am personally stronger and healthier physically, mentally and spiritually because of my time on "The Way." May God bless your Camino with His grace and peace! Alissa, Thank you so much for your help in coordinating this trip. Adding my two sons into the itinerary was extra work and I appreciate how seamlessly it happened. The trip was wonderful. Raul and Roberto were excellent guides and a pleasure to hike with. Spain was a very welcoming country and Fresco has a well-run tour. Again, it was a wonderful trip for our family and we will absolutely refer our friends to Fresco that are considering trips to Spain. Gracias! What a Wonderful, Fabulous Holiday! Dear Alissa, Before the euphoria wears off.......I just wanted to say what a wonderful, fabulous holiday! The professionalism shown by you in all the preparation stages was impeccable. This was then trumped by the actual holiday itself! Every aspect of the tour (travel arrangements, instructions, accommodation etc) was covered in detail. 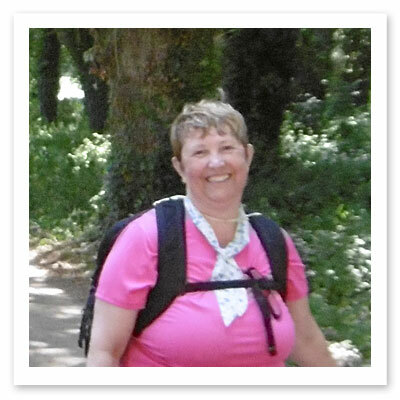 This in turn allowed me to experience a trouble free effortless and exhilarating Camino! 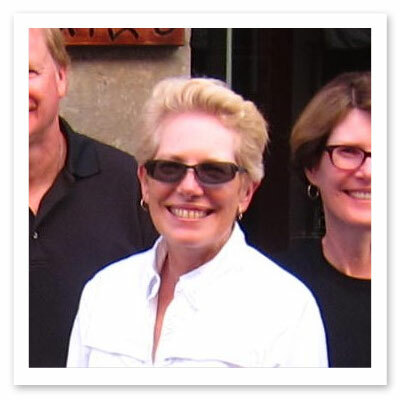 Sadly, Adios and muchas gracias, Trish. Hi Alex, I thought you may want some feedback on our latest tour: My pre tour bookings and information by Alissa was handed quickly and efficiently. The group we walked with (all spoke the same language) worked well despite different backgrounds, etc. David and Jeffery ensured any problems were attended to immediately. The accommodation and selection of restaurants were excellent, especially the last breakfast. The morning and afternoon breaks were all welcomed by Carlos and in surprising places. 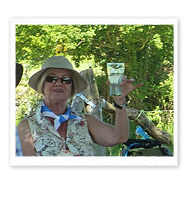 The picnics were always on time, well thought, in pleasant surroundings and made with passion and pride. It was almost too good eat. David and Jeffery gave clear instructions on the walk and repeated them several times (no one got lost or took a wrong turn). They were always there at everyone's call and knew their history as guides. I guess the sign of a good organisation is that we did not hear or see any problems. Everything went smoothly as per itinerary. The two things that amazed me were the extra mile the two guys went: pouring drinks for people, getting aerated water or Rose wine - all of which were asked for once and then remember by them at every meal time. The other point is that all of their work was done with a smile and PASSION to the very last day. I employ around 500 full-time employees and know how difficult it is to get some good people and you have two very good ones and one very good office person in Alissa. Congratulations on your choice of employees and the culture of your organisation. Happy to give any other information and I will be recommending the tour to many others. Cheers, Barry. Alissa, Ashley, et Alex: Thanks for your kind note! 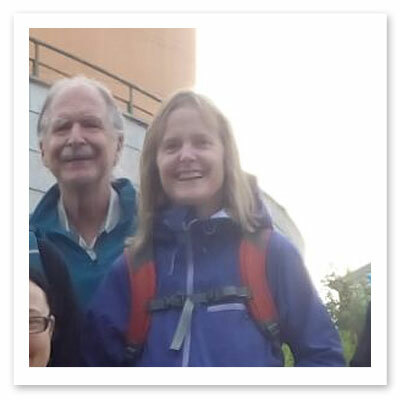 Christa and I had a wonderful time on the Camino and want to thank you, Jeffery, and all the others behind the scenes who made it all work so well. Reservations and luggage transfer went without a hitch and allowed us to concentrate fully on enjoying the experience without worrying about logistics. We feel we really got the taste of the Camino! As for those yellow arrows: I certainly with there were more of them in our lives! We would definitely recommend your tours to our friends! Thanks Fresco for a Bang Up Job! I miss our Camino buddies. It was a joy to share the experience with all of you. Thanks Fresco for a bang up job! Double the pay to Jeffery and David. They are emblematic of what guides should be. Wise, efficient, great organizers, awesome picnic providers, and great encouragers when I was trailing in behind everyone else. Carlos is a very safe driver and he always gave me the right kind of chocolate. Love to all, Cia. 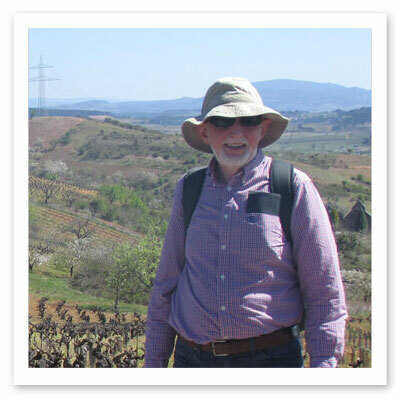 Fresco Tours is such a nice way to do the Camino. The guides give you the encouragement to walk father then you ever thought you could in a day. The guides were very communicative by having meetings and keeping us informed always on what the next day would bring and what the trail would be like and where we would be staying. They didn't miss a thing. Fresco Tours has a very nice system to help people succeed. Thank you. I can't speak highly enough of our Fresco Tour leaders, Jeff and Raúl. 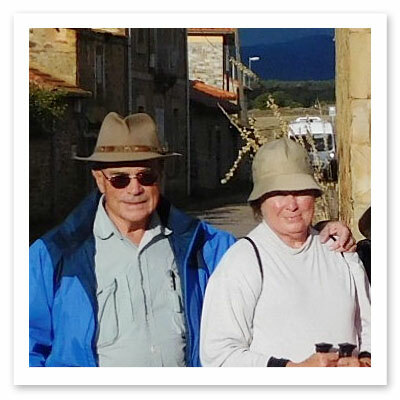 Their knowledge of Spain, including the culture, the peoples, and the Camino and its history, was impeccable. 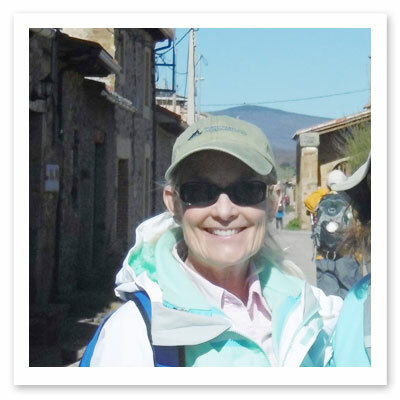 I would not hesitate to recommend (and have already done so) Fresco Tours as the only tour group to choose when looking to experience the Camino. The tour exceeded my expectations on every level. Well done Fresco Tours! They went above and beyond the call of duty to be sure all my meals were lactose and gluten free. Always available to answer questions, nothing seemed too trivial to deal with. Knowledgeable about the region and history, each evening's meeting was an education as we prepared for the next day's trek. 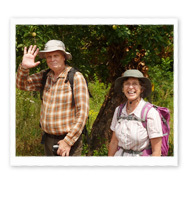 Outgoing and caring personalities and team work made them ideal companions for the entire tour. Hi Alissa, A great big thank you to you and Jeffrey! The Camino was an amazing experience, one that I would certainly recommend to others and consider doing again myself- maybe the Portugal Way. I felt well prepared with all the information Fresco had provided. The food was delicious. Our group got along very well and many of us plan on keeping in touch. Thank you and I hope we cross paths again in the future. Just to say that the tour was really great! Thanks for arranging perfect weather! Everything handled very professionally from beginning to end. Also I must give special thanks to David. He is really someone special, but I am sure you know that. Apart from the fact that he completely saved the trip for me after I took a bad fall, he is the perfect combination of guide, friend, and all around terrific person. We hope to travel with you again! The trip was great! I thought you and Fresco tours did a wonderful job of arranging everything for us. I also appreciate your help Alissa on the backend helping us get back from Santiago to Madrid. You all did a wonderful job! Please pass this email on to your supervisor so they know how much people like us appreciate your help. Take care. 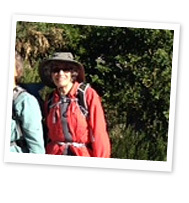 Hi Alex: Steffi and I thoroughly enjoyed our Camino; it was beyond our expectations. Our guides Carol and David were great. They took care of every request and every detail; we could not of asked for anything more. It was such a positive experience dealing with you, your office and your staff. We will definitely recommend Fresco Tours to our friends. Regards, Frank. The Creation of a Memory of a Lifetime! Hi Alissa, We thought the job that Fresco did was exceptional. 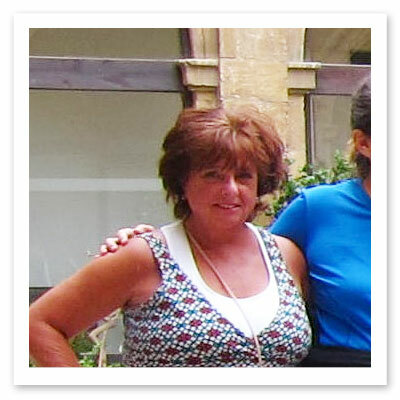 Outstanding: yourself Alissa, everything we asked for you always provided accurately and on a timely basis. For example, arranging the overnight sleeping arrangements on the train! Wonderful! The two hotels we stayed at the front and back and of our trip were phenomenal, as was the manor we stayed at. The opening night dinner with Roberto was wonderful and was a great launch to our great journey! Our luggage was always picked up before nine and waiting for us at our next hotel when we arrived at the end of another challenging day: most excellent! Castañeda: the two gentlemen who ran the hotel were most solicitous and anticipated our every need. Really can't think of any negative experiences with any of the hotels. 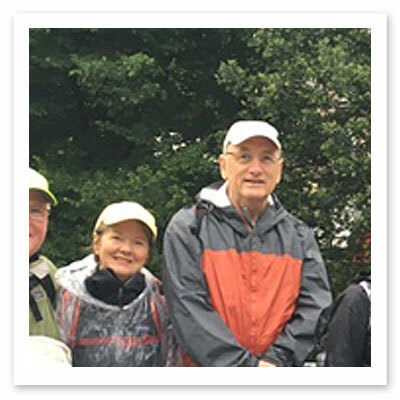 Thanks again for your efforts in assisting us with a stellar pilgrimage; and the creation of a memory of a lifetime! Hola Alissa, In my dreams at night, I'm still walking the Camino. It was an awesome experience starting from Madrid with the train ride as an added bonus. The hotels were nice and the luggage transfer was smooth. Thank you for the experience and I will do it again...this time longer. 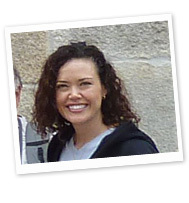 Hi Alissa, We all loved our taste of The Camino. Fresco did a great job to make our days very stress-free. No map reading either- loved that yellow arrow. Our group all got along very well and it was good to get to know the girls from the U.S. and Canada! Taxis were very helpful and the sangria, fresh juice, and cerveza provided great refreshment! We especially loved the accommodation at your great hotel choices. 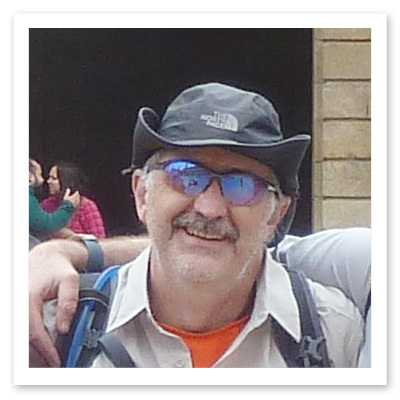 Roberto's introduction at Ponferrada was wonderful and the meal he hosted was definitely our best on the walk. Yes, we are missing the yellow arrow and have continued to do lots of walking. 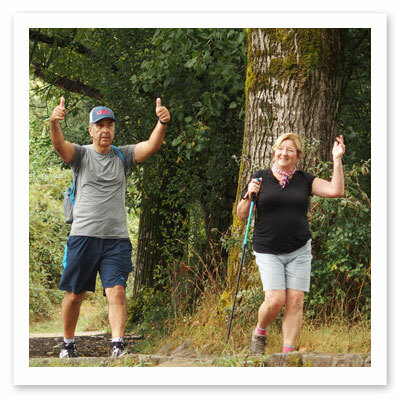 We will always remember the beautiful scenery of Galicia and the fantastic time we all experienced doing this small part of the Camino.We would highly recommend Fresco to our friends. 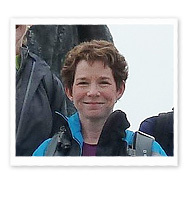 Thanks so much Alissa for your great support and communications over the past few months. 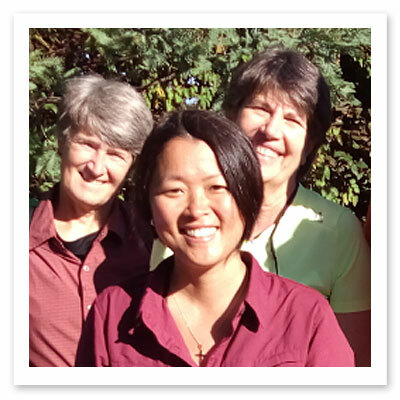 Warm regards from Suzette, Judy, and Dianne. Just wanting to express a heartfelt thank you to our guides Roberto and Sol. It was an amazing tour which I will never forget. There were so many wonderful moments along the journey. Both Roberto and Sol's attention to detail made this a truly memorable occasion. Bravo! After eight years of talking about the trip, we would rate our experience as spectacular! 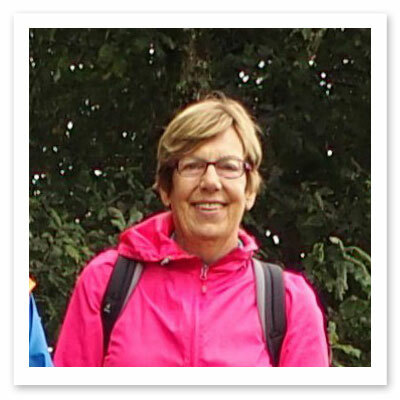 Hi Alissa, We loved our tour and enjoyed the walk and accommodation very much, it's definitely the way to do the Camino. Many thanks for all your help with train bookings and your prompt reply to any requests. Kind Regards, Sandi. Loved the Tour, Had an Amazing Experience! Alissa, Loved the tour, had an amazing experience! The group was fantastic, Roberto gave us a great introduction and first morning orientation, and you have been very prompt in your communications. Thank you. 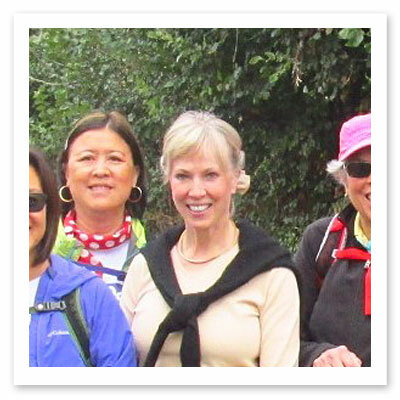 Dear Alissa, I thought Fresco did a great job in making the Camino such a rewarding experience. Carol's orientation was terrific and the delicious meal courtesy of Fresco made it a great start. I thought the accommodation was very good, and a few especially so - just loved the country manor. Having bags awaiting you on arrival was just splendid. Much enjoyed our fellow pilgrims as well, a few of whom I'm sure will remain friends. Well and truly home now, and it's amazing how quickly you slip back into the hustle and bustle of daily life. I know however that I will always remember my time on the Camino. I thought it a wonderful experience, deeply satisfying in so many ways. Thanks again and best wishes, Kerrie. Dear Fresco Folks, We have just returned home and we are still processing our incredible trip! 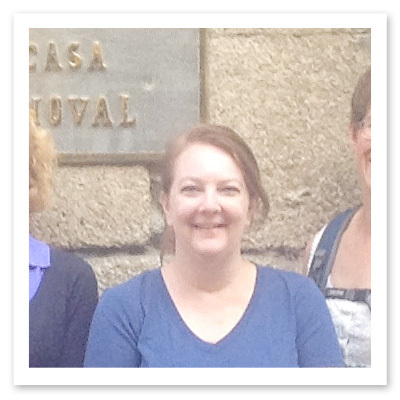 Our orientation in Ponferrada with Carol was great. 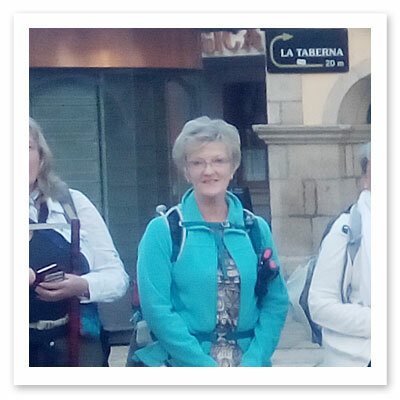 Having her walk us out of Ponferrada was helpful as we were able to come up with spontaneous questions for her. Thanks for the incredible dinner on our first night, allowing us to get to know our companions and feel more acclimated to Spain and what lay ahead for us. The packet of information was thorough and educational - just what we were looking for on a self-guided trip. We used the maps, the "survival guide" and other info every day and found it really added to the pleasure of our trip. The hotel in Santiago was perfect - just what these weary travelers needed. The guide in Santiago was also fantastic! 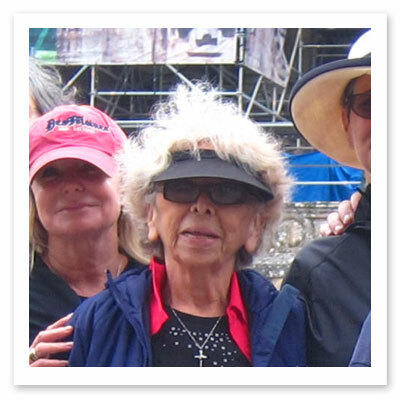 She was so learned and fascinating, and took us anywhere we expressed interest in going - including the cloistered convent where we were able to purchase the famous cookies that they make. Finally, your website is great - lots of information for the curious and those who have signed up. 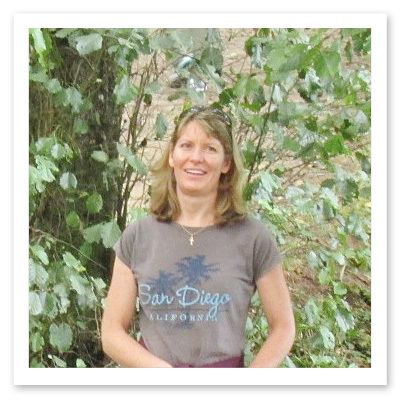 We received enormous support from Alissa in travel arrangements and it made things much easier for us. We would not hesitate to recommend Fresco to any of our friends. 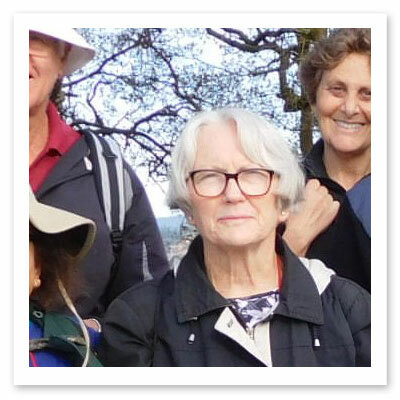 Thank you for making our Camino so special. Hi Alissa, Overall it was a marvelous once-in-a-lifetime experience that will remain happily ingrained in what's left of my memory. We formed a cheerful coterie. Although we each walked alone for part of the walks, we shared many walks and meals and became more and more comfortable as the days of conversation and laughter progressed. I felt a real pang when we parted! Although Fresco Tours could not have known how our personalities would mesh, I'm willing to give credit. I appreciate the prompt attention given to any inquiry along the way by your staff. A special thanks to Alex, who answered the question of the address of my hotel when another pilgrim called Fresco after I had managed to lose this information! And kudos to Carol, who cheerfully answered an infinite number of questions, straightened out any minor snafus, and arranged the best meal of our trip. It's Hard to Re-Enter Reality! I had a wonderful time, and I feel like I really got to experience the flavor' of Spain. 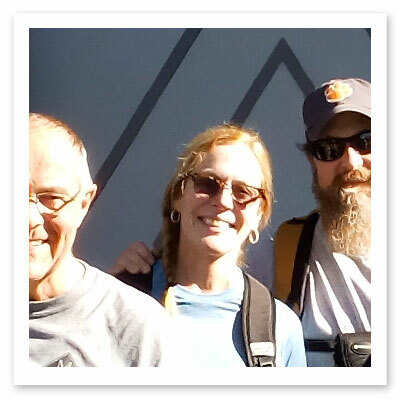 The people were gracious and welcoming along the way, the food and accommodations were of the highest quality, and Jeffery and David provided just the right amount of guidance and information along the way. Because of this experience, I can truly say that I love Spain. Thanks for providing such a positive experience. Hugs, Chris. 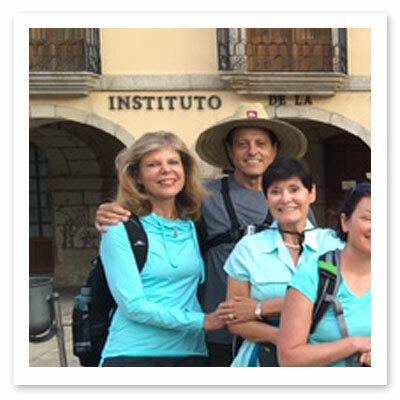 Dear Alex and Staff, I cannot express in words of gratitude what a wonderful experience Jeff and I had walking the Camino. Jeffery and David were so exemplary in their gift of organization, but for us, they got us started and then let the experience happen. They are quite a team. What we would eat (especially for Jeff who has never had anyone so catering to his allergies), and where we would sleep was never a thought to us, but such an astonishing surprise that just to know all we needed to do was put one step in front of the last. It put meaning, presence and attention to every moment. I thank them very much. Dear Alex, In addition to our sincere compliments on the beautifully planned tour, our terrific guides, Jeffery and David, and their wonderful picnics, the restaurants and accommodations and the photographs, I would like to add a note of appreciation for Alissa and her responsive and helpful attention backing you up in the office. Due to the time difference between the US and Spain, she sometimes had to get back to me at what must have been very inconvenient times for her personally. She was always cheerful and patient. 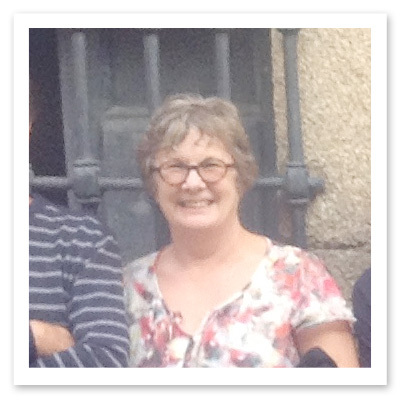 Her advice and ability to save us money on our train reservations and her help adding a couple of days to our Madrid hotel reservations were most appreciated. Please convey my thanks to her. Also, I really enjoyed the local guides you use. Their knowledge, interests and general helpfulness were excellent. 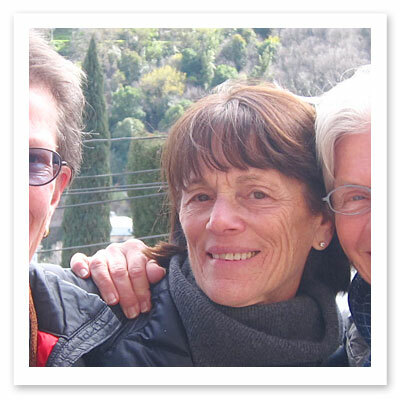 I especially loved the morning we spent in Santiago with Margarina. Our visit with her to the Cathedral and Museum was absolutely wonderful. We saw and learned so much in the two+ hours we had. While we were on our way to the Cathedral, she ran in to an acquaintance who works on the Botafumeiro crew and he gave her a heads up that someone had paid to have it done at the Pilgrim's Mass the day we were there! Thus at the end of the tour, she walked us exactly to where the Botafumeiro would be swinging right over our heads. She was also very helpful about giving us several restaurant ideas and directions for lunch afterwards. Finally, it was a pleasure meeting you and Lucas at the picnic on the road to Leon. I close with thanks for all you and your wonderful associates and colleagues did to make the Camino so kind, comfortable and enjoyable for us. John joins me in sending greetings and best regards to all. Sincerely, Tracy. Alissa, The trip was wonderful--the staff, hotels, food (more than any of us needed), preparatory material, etc. The guys were also very gracious in helping me practice my Spanish. Also, the hotel on our last night was perfect--near the airport, clean, and the staff was extremely professional. After the Camino, we took the train to Lourdes, France. It was also memorable. Thank you for your assistance. 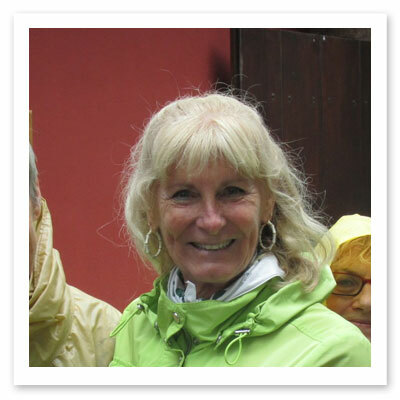 I wish to say 'Thank You' to Fresco Tours and their inspiring tour guides, tour coordinator and driver. Yes - I know I am slow responding, but you have to admit I am fast on the slopes. I wanted some time to ponder over this extraordinary journey we went on before commenting. Jeffery and Jason were very professional and caring at all times. Their knowledge of local and Spanish history brought the places alive. I do not know how they kept their patience with all the questions, injuries, and 'quarter mile' teasing. Alberto, our trusty steed, was most kind. Alissa was also very helpful coordinating people. I think herding cats would be easier. As a matter of fact, the accommodations and meals were beyond my expectations. I think it is because I went with none other than the fear of getting ill or injured. Ironically, I did not get a blister or a callous on my feet. I have been singing your praises to everyone who has asked me, especially after they saw the pictures of the meals and accommodations. 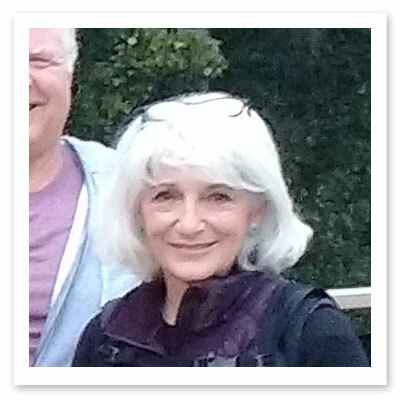 I belong to two pilgrim societies and at their next meetings I will make sure that Fresco Tours is mentioned and that your contact info is passed on. The highest compliment I can express is that this adventure has inspired me to go back next spring to complete the section from St Jean to Leon. In addition, I am considering taking you up on your 'Basque Country' offer next fall. This inspiration has to be laid at the feet of Jason and Jeffery. 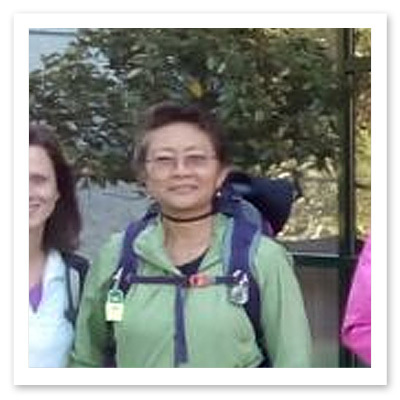 I am still walking so that I can be ready for next year - walked 18 km on Sunday. Buen Camino to 'Wonder Woman'and his side kick 'Superman'......Merci Beaucoups and Muchas Gracias. 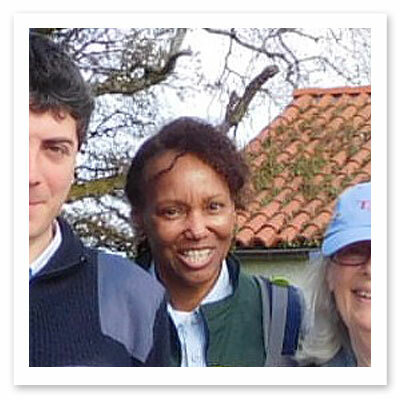 Hi Alex, Just wanted to thank you and your wonderful team for a memorable, exciting and very magical Camino. It was such a fantastic time and one I will never forget. The friendships made, the laughter shared and the pain of blisters overcome. All made possible by the superb Fresco team of Roberto, Raul, Jesus and of course, the organiser extraordinaire, Alissa. The accommodation, food, wine, commentaries, support  everything was above and beyond what I had expected. Please thank the whole team for me. 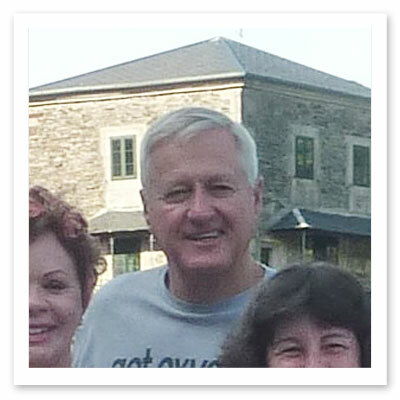 I am telling all my friends about Fresco and encouraging them to take one of your tours. My special thanks for all the care I received when I was unwell. It was unexpected but delightful and demonstrated a company willing to go the extra mile to make the journey safe, comfortable and enjoyable. I wish you every success in the future and hope to travel with you again. 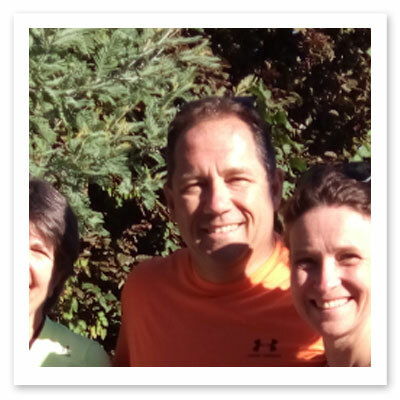 Hi Alissa and Alex, The tour was a great experience, challenging but rewarding, in great part due to all of you. You run a first class operation, well organized, paying attention to every detail, the accommodations, the meals, the sightseeing were all superb. I can't be thankful enough, being the oldest one in the group, for the support I received from Sol, Jason and Alberto who looked after me all the time. Muchas gracias, un afectuoso saludo y espero verlos en el futuro. Dear Alex, I returned home only yesterday. I really enjoyed my holiday in northwest Spain with Fresco. Jeffery and David went out of their way to make the holiday a memorable one for each one of us. They were very knowledgeable about the area and its history and took the time to explain it to even the slowest ones in the group. They were also very patient and helpful; and this, coupled with a good group of walkers, resulted in a great holiday atmosphere and a great shared experience. Alberto, the driver, was very attentive and helpful at all times. I would certainly recommend Fresco to all of my friends and am considering your Basque tour next year. 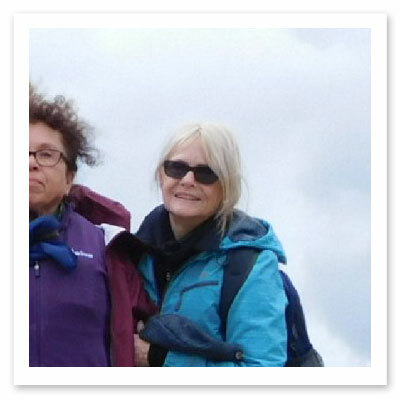 My group of walking friends have walked in Europe as a group for about twelve years on organised and self organised walking holidays and I feel that the Fresco walk was the best and most enjoyable of them all. Well done! Best regards, Graham PS: Many thanks to Alissa. 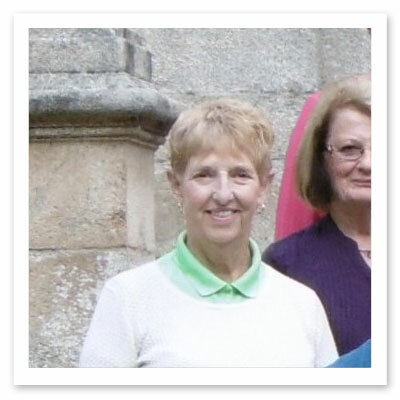 She was extremely helpful with the tour arrangements and very competent  an excellent customer contact person. I Felt Like I was Walking through a Storybook! Everything was Magical! 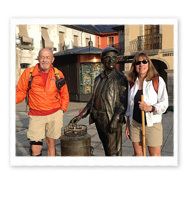 In a Word, Our Experience on the Camino was Fantastic! 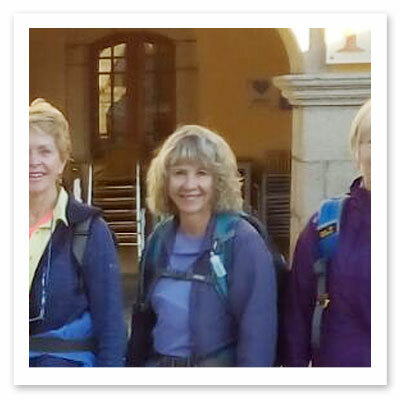 Now after doing the Camino trip four times, I would probably do it a fifth time, do the self-guided Camino, or consider doing the entire Camino in four years. Thank you! It was a wonderful trip. All the details worked out well, you were very helpful answering questions and handling pre and post trip plans, the maps and books were good and our group turned out to be tons of fun. We had a fabulous time and I want to go back. 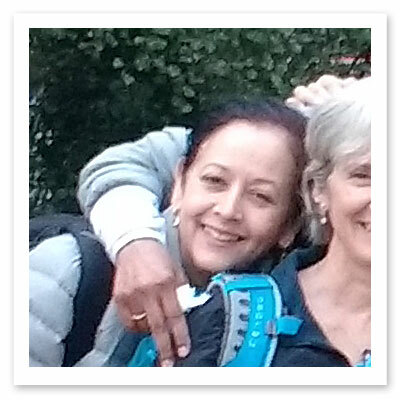 Alex, Hola, gracias por tu mensaje y quiero aprovechar la oportunidad para felicitar a Carol y a Roberto, en verdad son unos excelentes guias y unas excelentes personas. Estuvieron pendientes de nuestras necesidades en todo momento e hicieron de este viaje algo aun mas especial! Tambien me gustaria comentarte lo bien q se porto el Hotel NH con lo del robo del bolso de Maria, fueron muy amables con nosotros y nos ayudaron mucho! Gracias por todo y espero viajar y recomendar Fresco a todos mis amigos!! Saludos desde Mexico! !